establish what we do next to consolidate the building. translation: the whole fire is out. 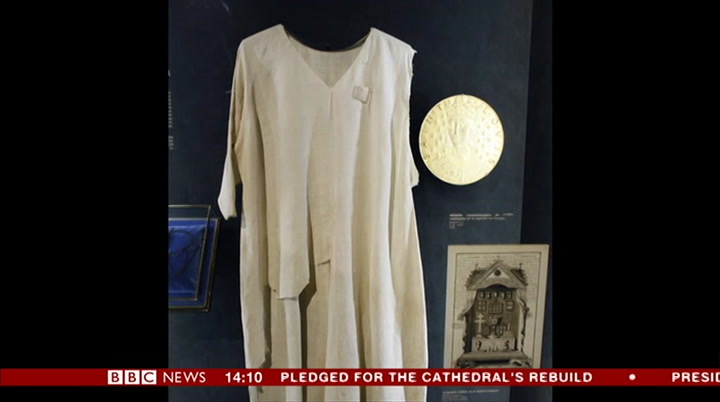 emergency teams managed to rescue valuable artwork now we are investigating and a set and religious items, of experts is analysing including what is said to be the crown of thorns worn byjesus all the structures to establish what we do next to before his crucifixion. consolidate the building. i'm lyse doucet live here in paris, emergency teams rescue priceless a rtefa cts and religious items — where there is a new sense of hope including what's said to be that the cathedral will be the crown of thorns, worn byjesus, reconstructed with offers of help before his crucifixion. pouring in from around the world. 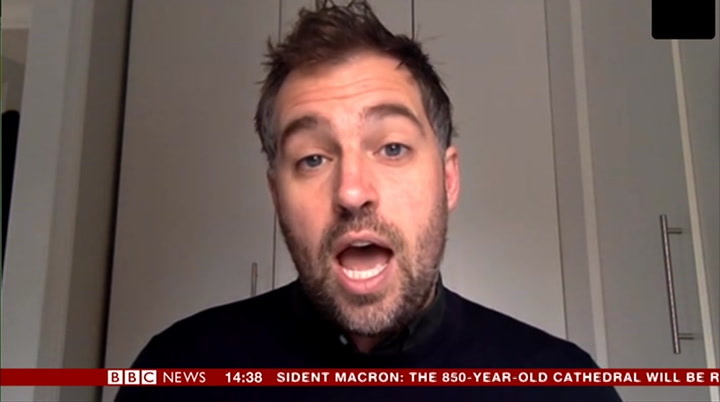 here, more than 120 climate change activists are arrested for blocking roads in central london amid protests aimed coming up on afternoon live at shutting down the capital all the sport, hugh ferris. 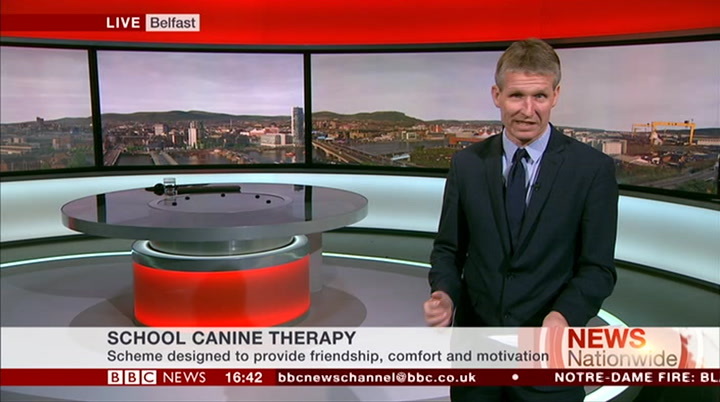 and new research suggests hello. good afternoon. 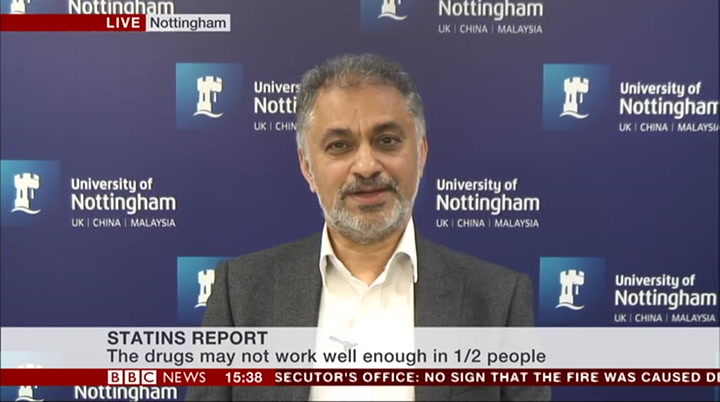 manchester united and they managed to return to cholesterol—lowering "statin" drugs don't work well enough, a famous venue but they might need a in around half of the patients miracle to reach the semifinals of who are prescribed them. the champions league. more later. thanks hugh, and ben rich has all the weather. ben, cloudy today but it's warming up. yes, the cloud isn't going to stick around, sunshine on the way and higher temperatures as well. i'll have all the details later on. but, reason to hope as well. this tragic event. 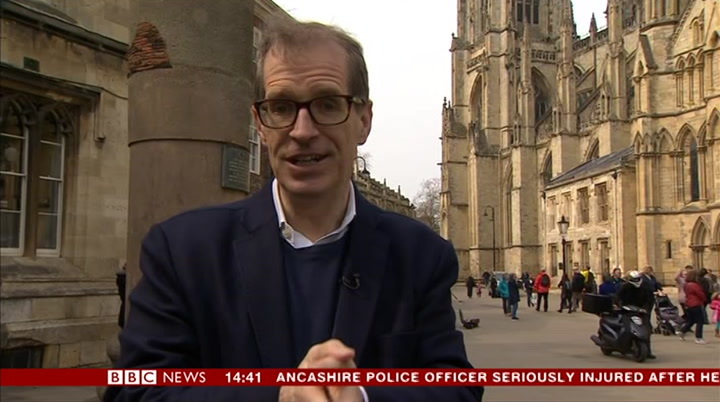 translation: this is a terrible fire that has destroyed this heritage building, a cathedral is a place of worship, and in the week running up to easter but the stones of the church are a living thing. 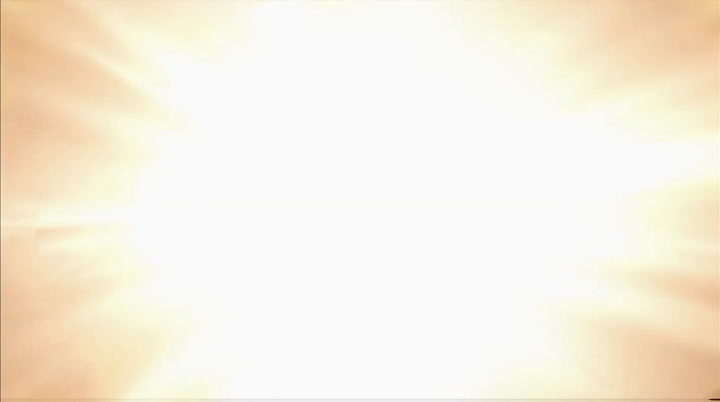 catholics have a special reason to we are not burnt. mourn. but, reason to hope as well. this is despite the recent incidents against churches, we are not burnt. the church is alive. a terrible fire that has destroyed this week we will celebrate the this heritage building, but the passion and resurrection of christ. stones of the church are a living already minds are turning thing. we are not burnt. 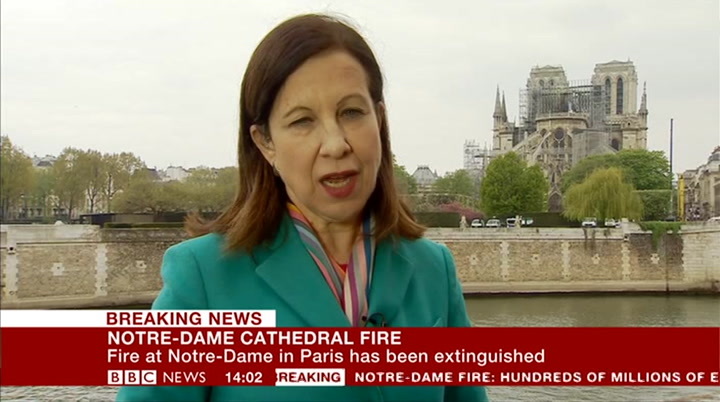 despite the to what needs to be done, fundraising, reconstruction, recent incidents against churches, the head of the notre dame we are not burnt. the church is foundation, which long before the fire was raising money alive. this week we will celebrate for renovation, told me contributions are already flooding the passion and resurrection of in this morning from around world. christ. already mines are turning to what needs to be done, fundraising, last night i said, ok, reconstruction, the head of the what should we do now? 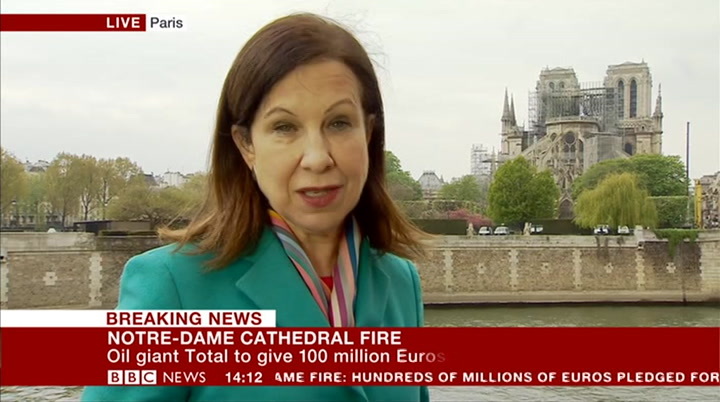 notre dame foundation, which long because the fire was extinguished before the fire was raising money in the middle of the night, and this morning i said, for renovation, told me what do we need to do, contributions are already flooding in this morning from around world. let's tackle it, yes. last night and said, ok, what should we do now because? because the fire it will be saved? yes, yes, it will be saved, was extinguished in the middle of i'm sure it will be saved. in london. 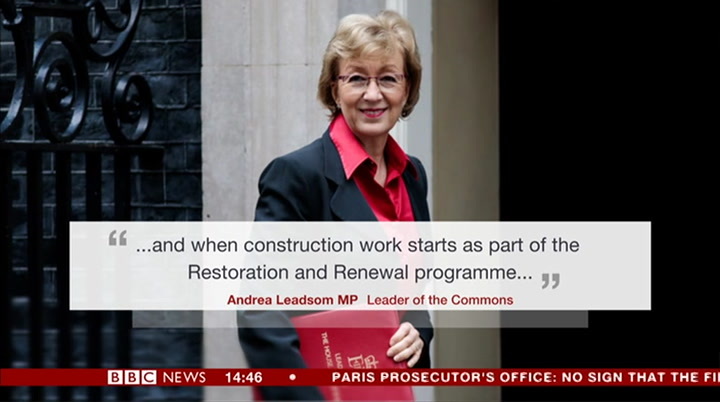 we will talk to you rebuild it. 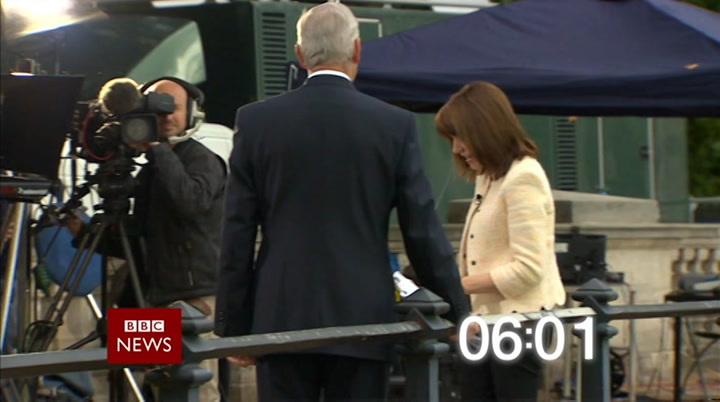 the day began with generous pledges from french later. 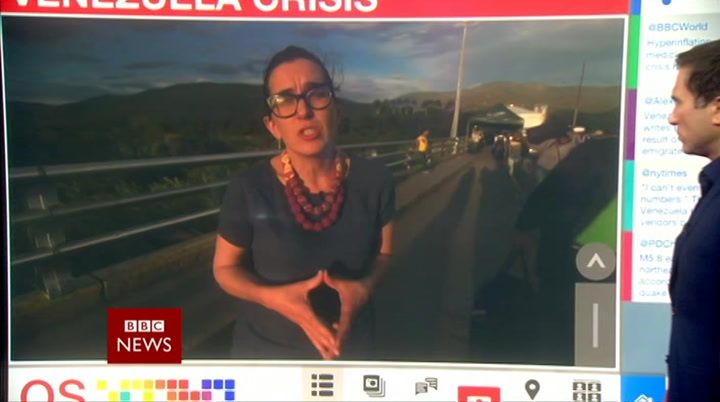 offers of help have been billionaires, we have heard from the flooding in from around the world. ceo of apple, who says he wants to president emmanuel macron wrote that contribute. 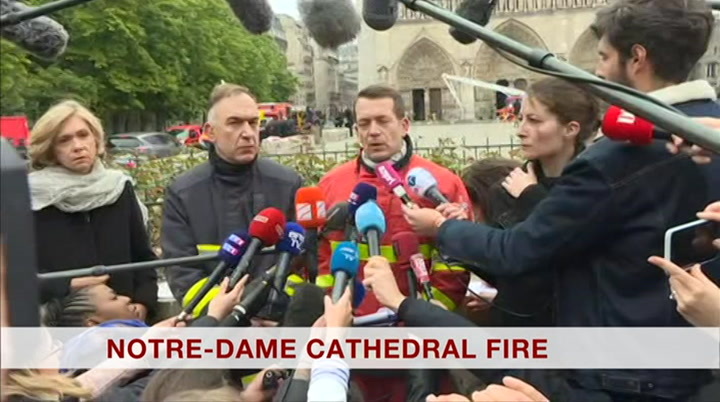 a commemorative coin the cathedral will be rebuilt. 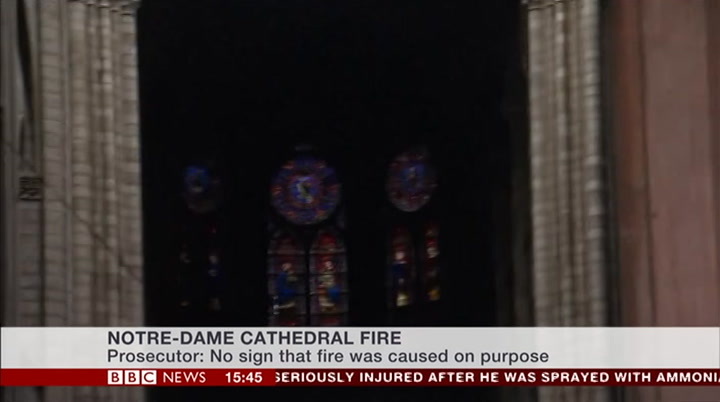 an which had been issued in 2013 to assessment of structural damage are mark the cathedral‘s 850th year, said to be carried out over the next two days. 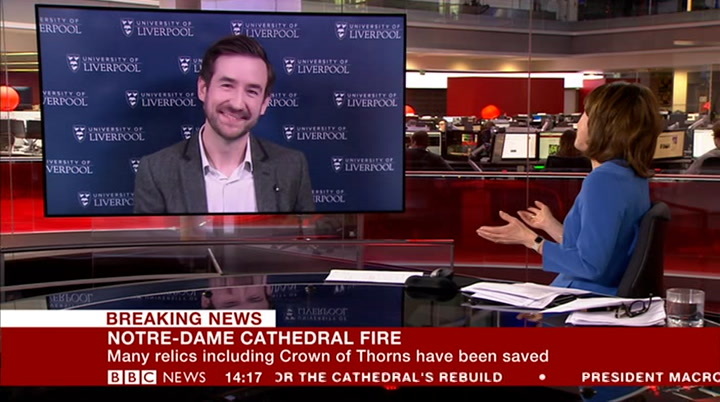 will be re—reissued, and all of the doctor nick webb is a lecturer proceeds will go to notre dame's of in architecture at the university of liverpool who specialises the building. the publishers of the in using technology—based solutions for building restorations. work, the great french writer victor hejoins us now. 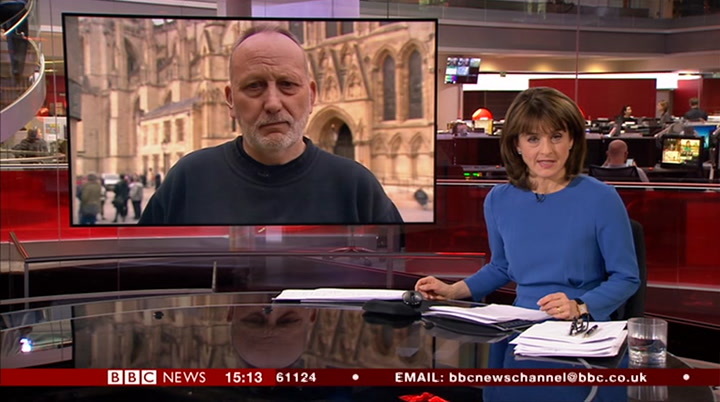 thank you hugo, who once described notre dame he joins us now. thank you for your asa time. 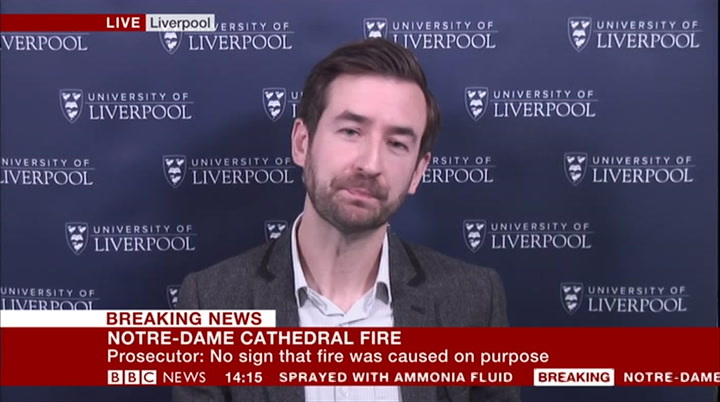 i'd like to start by asking hugo, who once described notre dame as a symphony in stone will see for your reaction to what you've profits going to the rebuilding. 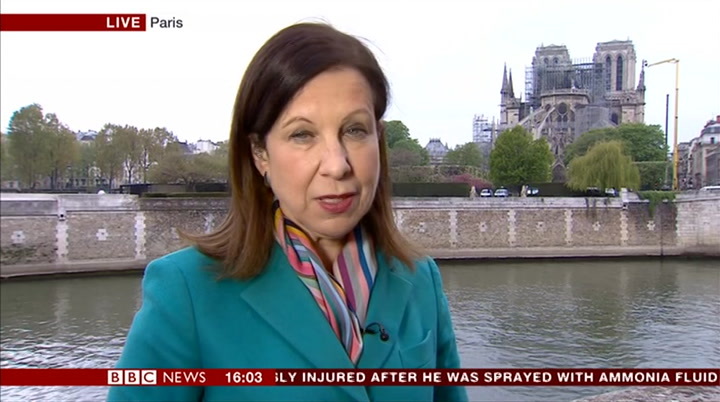 seenin this is notre dame, a place of for your reaction to what you've seen in paris. 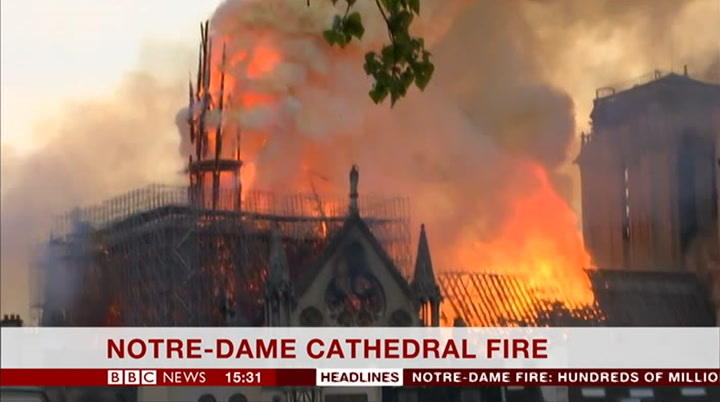 worship, art, heritage and now, a sign of hope that it will rise obviously, it's horrifying what happened. it's very saddening to see again. that's all from us in paris such a magnificent structure now for now. with us now is a lecturer partially destroyed. 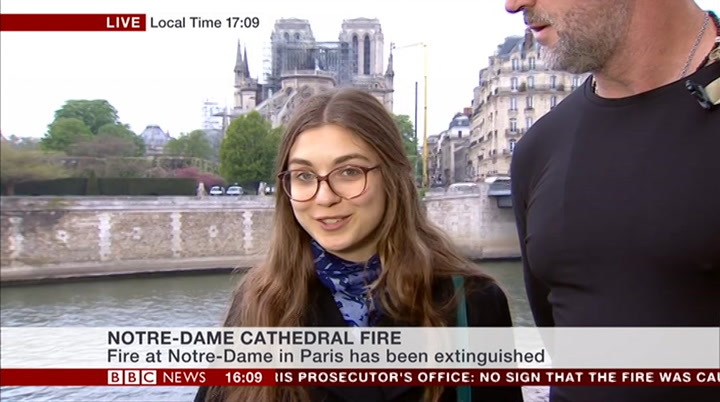 you say, specialise, as i say, in in early modern history at new technology—based solutions for couege in early modern history at new college of the humanities, she grew building restoration, tell us what up college of the humanities, she grew up in paris. i have to start by that involves, please? asking you what has been your reaction to the pictures you've so, we look at how you can use laser seen? scanning, which is a device that i was completely devastated. i think creates thousands and thousands of there isn't a single parisien who pints within a building, and you feels good today. i talked to my create something called a point cloud model, so it's essentially a family who are in paris, and friends very accurate three—dimensional around france, and we are all in model of a space, so a millimetre accurate. if we have one of these shock. notre dame is the heart of models, we can use that as the basis paris. some would say the heart of of restoration. in our case, for europe. 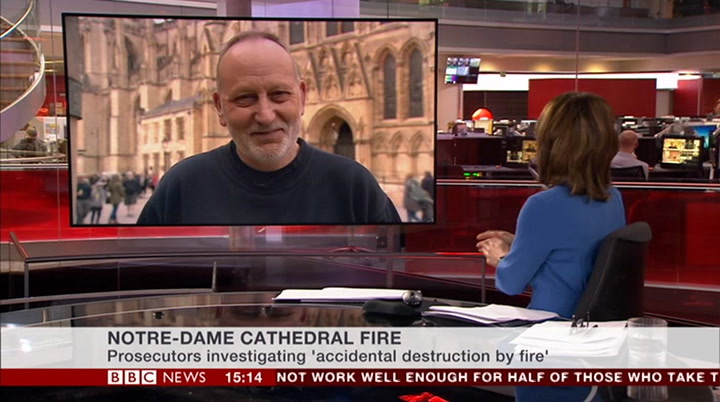 and so many of my european friends are reaching out to me as example, in westminster abbey, to investigate the existing structures. 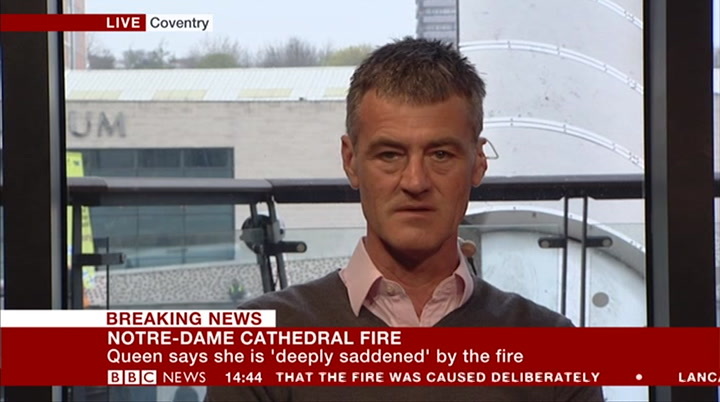 well, they are devastated as well. i so tell us about what you are doing realise, you know, it's the most there. we area important place in the world, right? there. 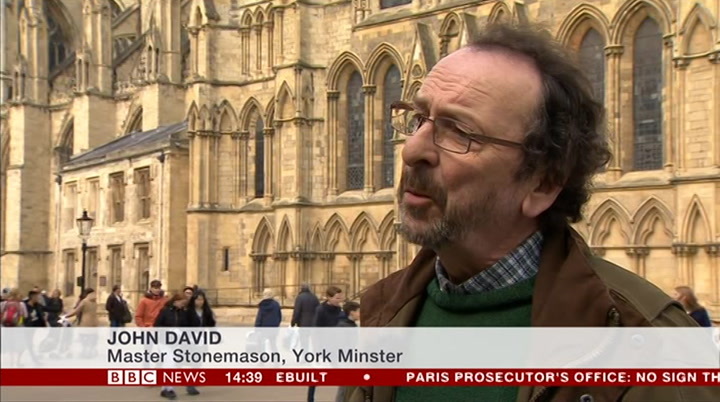 we are a small team of researchers interested in how medieval masons it isa important place in the world, right? it is a landmark. and it means so designed and constructed medieval much for any french person. vaulting, which, as you see at notre we are mourning. i can see how much dame, the majority has thankfully survived. 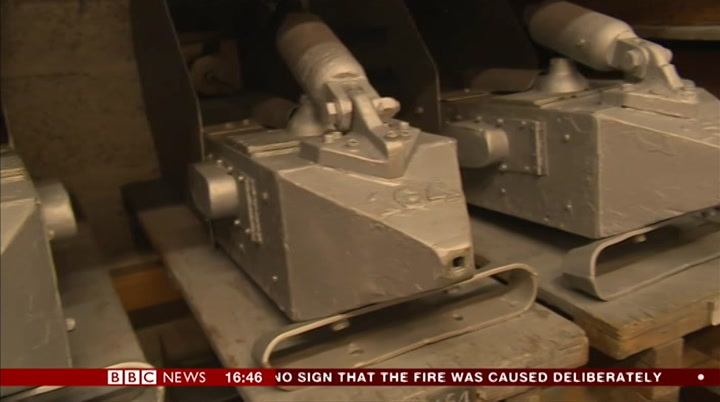 so with laser scan data, it means to you. thank you for we can try and establish what the coming in to talk to us. it's been geometry was that masons were using described as a living museum, hasn't backin geometry was that masons were using back in the 14th century. then we it? talk us through what the can predict how they were designing building has seen over the years. different components, norman elements, gothic elements, 19th—century interventions as well. 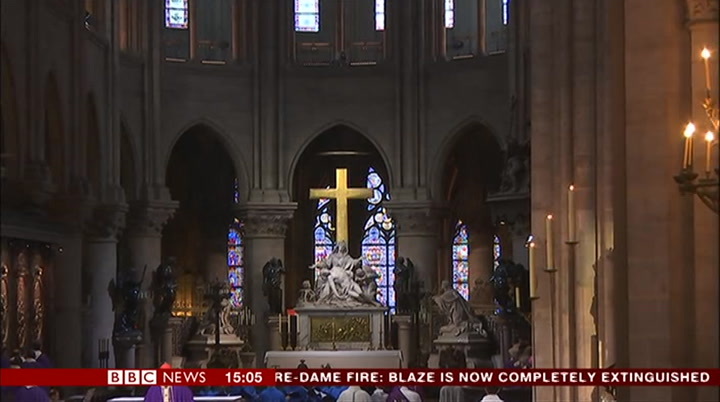 grounding in notre dame, charles de i think we have to take the fact gaulle, you know, his funeral was at notre dame. 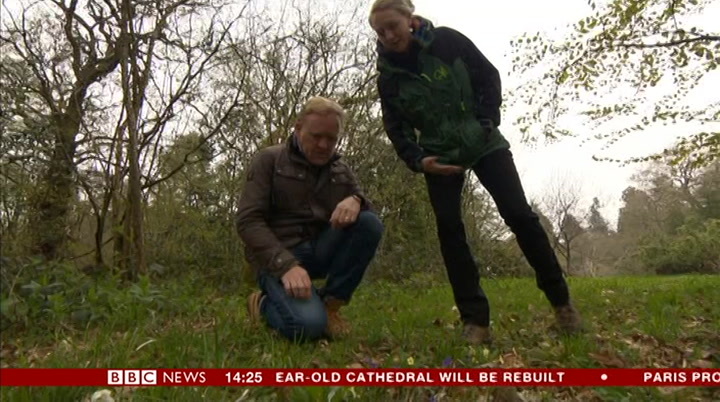 it is part of our that these cathedrals are evolving, history, our heritage. and big but, yes, certainly, it is an issue, putting something new back in. there events happened there. 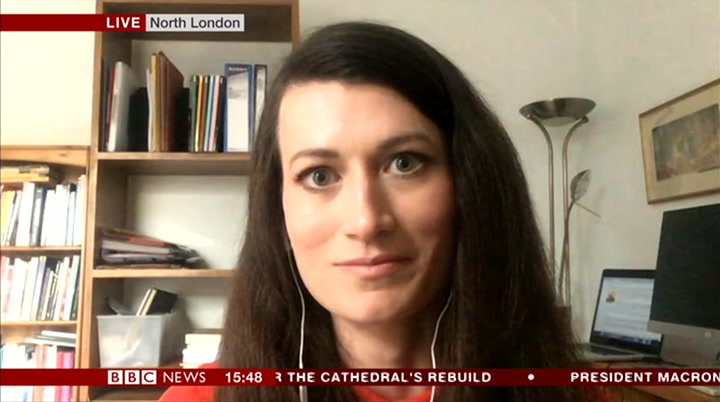 are other sites, for example, a talk us through some of the church in germany bombed by the historical objects, the relics allies in the second world war, there were questions about whether inside the cathedral. we've been it should be rebuilt or not. hearing a lot about the crown of thorns, which i think might surprise it's a difficult one. i want to some people, because it's not often solve it, but i suppose the on display, is it? conclusion is whatever happens, it can never be the same, can it? for me, the most important thing, two things, when i was watching it definitely not. but i think the was please, please, the crown of positives we can take from this, are the evolutionary nature of a thorns, definitely. but also the two cathedral. this willjust be the towers. 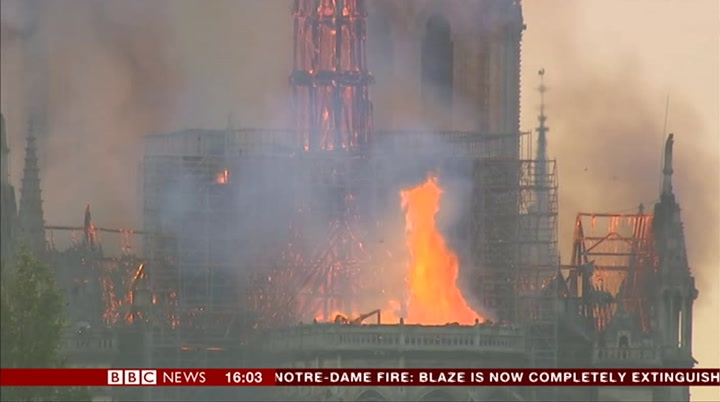 the two towers, you know, next chapter in notre dame's they are medieval, and i was like, history. 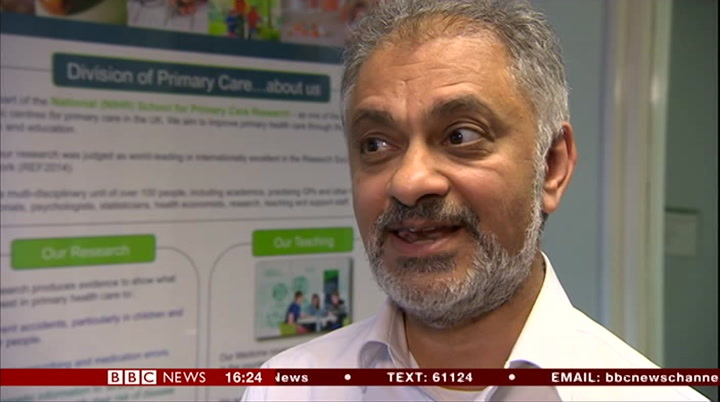 doctor nick webb, we can see you at please, stay strong. the fact that the university of liverpool because they didn't collapse is a symbol of of what is behind you, but i remind the viewers, thank you for your hope. it's for france, and for notre thoughts and expertise. dame. of cardiovascular disease. attached to how things were. but, you know, you have to think about the good news — in around half the patients, 49%, the future, and then, you know, what there was a significant benefit is history? 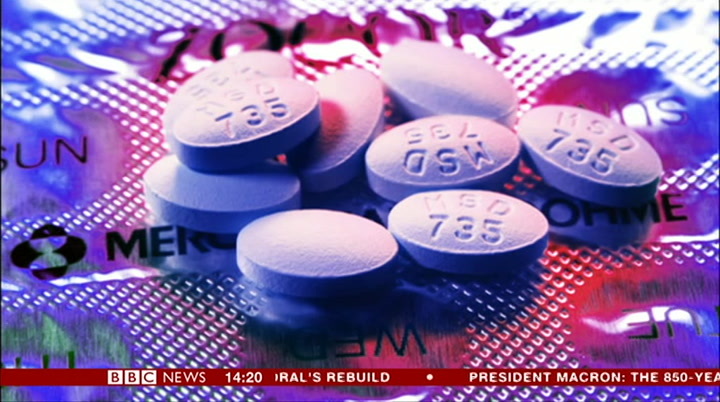 it's the ability to move after taking statins. harmful cholesterol levels went forward , is history? it's the ability to move forward, to learn about the past, down by at least a0%. 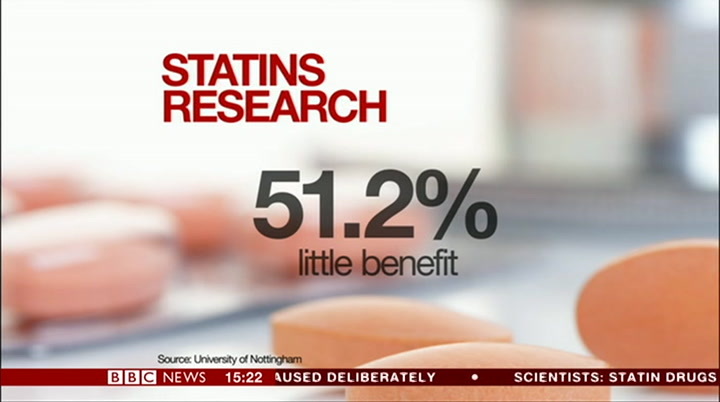 and to be aware and ready for the but the other half, 51%, saw little benefit from statins future. so maybe we need to think about what kind of history we want to their cholesteral levels within two years. to create now. 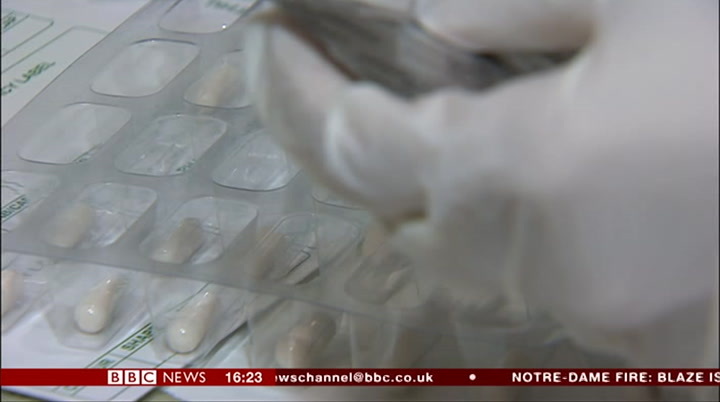 the drama has the researchers say there could be many reasons why some patients don't happened, the tragedy has happened, do as well as others. what's next? we need to think about individuals might not be following the instructions that it as what's next? we need to think about itasa what's next? we need to think about it as a nation, think about it as gps are giving to them. people. the other reason could be that it's great to hear your thoughts, there's some genetic variation thank you for coming to talk to us. that we are certainly learning a lot about now. as you have been talking to us we've the british heart foundation suggests another reason. 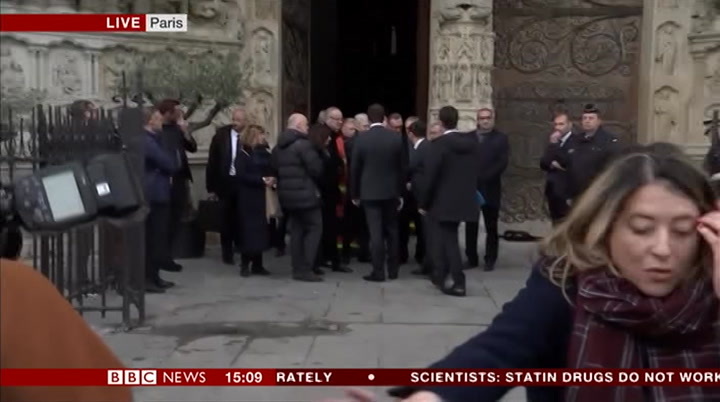 been watching live pictures of it insists statins are an important proven treatment, but that paris, clearly, the restoration some patients may not be on the optimum dose. 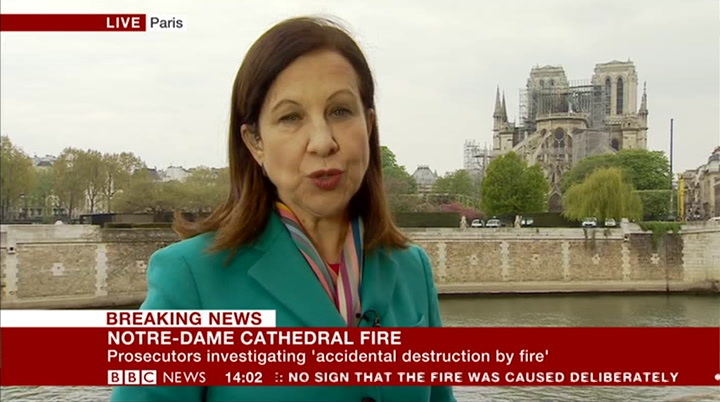 work, the repair, the valuation of so we would like to make sure that the damage of notre dame is ongoing. 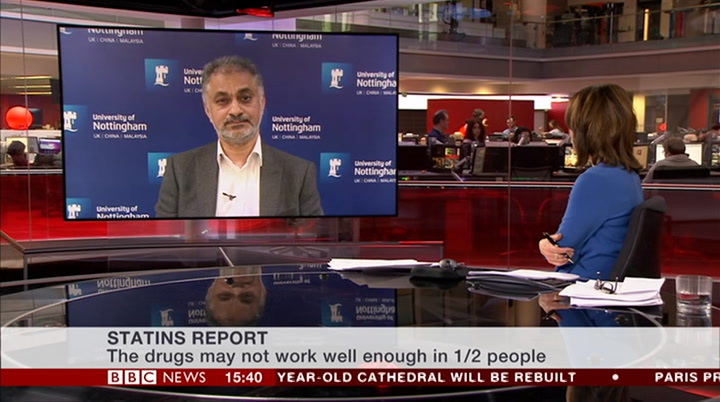 patients are on the best dose possible and getting the maximum from their statins to reduce we will be, for days, weeks, and their risks further. months to come. 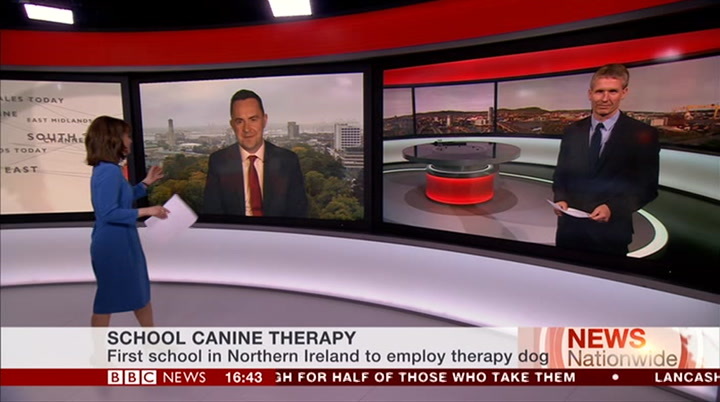 thank you again, this study is a stepping stone, but much more research is needed. a front—line gp who is involved estelle. few days, and, as already advertised, quite a bit warmer. this is the satellite and radar picture today. 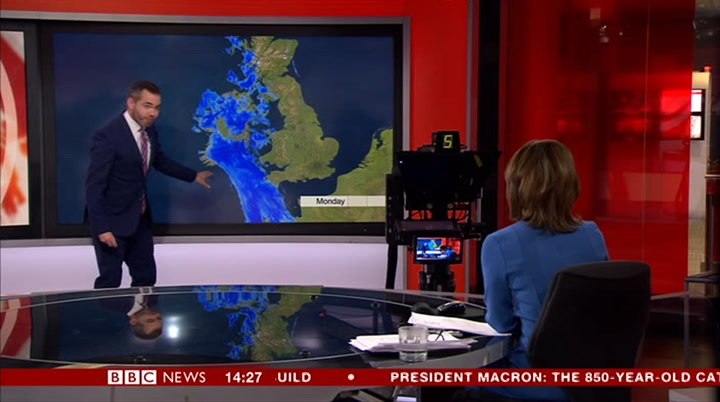 this stripe of cloud, outbreaks of rain, slung across the this is bbc news — british isles. that rain moves very our latest headlines. 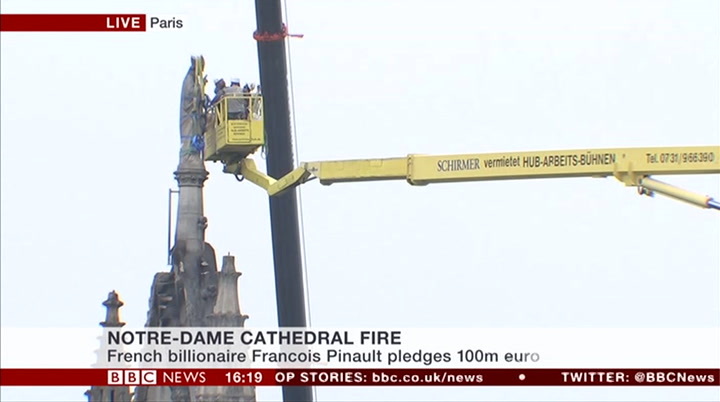 hundreds of millions of euros have been pledged to return the notre dame cathedral slowly, petering out in many places. 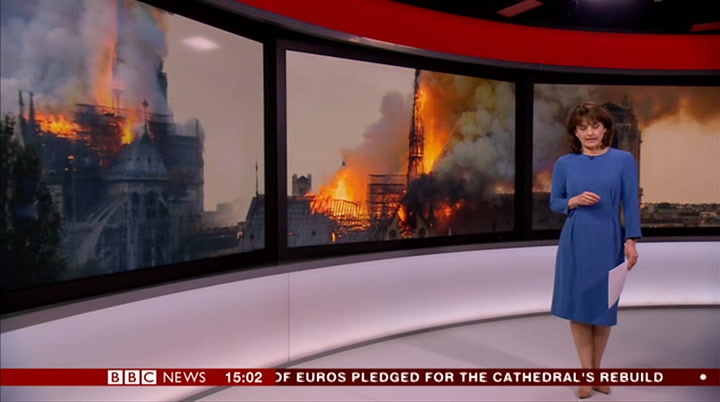 in paris to its former glory after firefighters worked though down because the western side of the night to save it from a devastating fire. scotland. 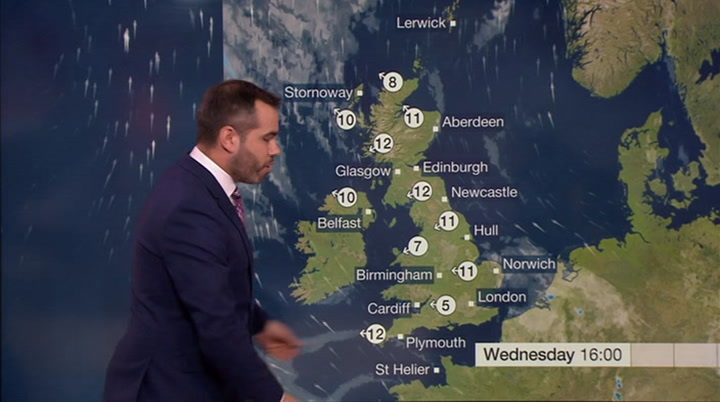 brightness for the extreme east of england and north—east the extent of the scotland. 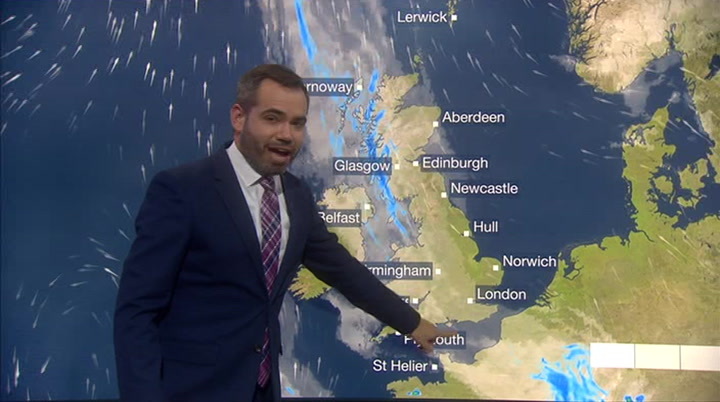 brighter skies for parts damage is revealed — of devon and cornwall. temperatures today about where they were as french president emmanuel macron yesterday. this evening and tonight, vows to reconstruct the historic building. this stripe of cloud and rain continue to break up, fizzle away, staying damp for western scotland. 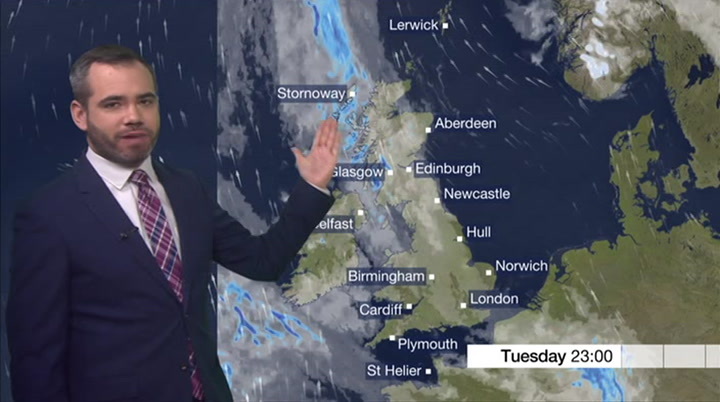 a night of shock and despair most staying damp for western scotland. m ost pla ces staying damp for western scotland. most places dry with clear spells. fog patches were part of wales, the in the french capital, but relief now that midlands, the south—west of england, the main structure of the building remains intact. not particularly cold. almost all of officials say they're treating the blaze as an accident — not arson. us avoid a frost. into tomorrow, early fog, mist, and merck, that cloud breaks up, and tomorrow promises significantly more sunshine across the uk than we had today. you can pull out a sample from 1951, and renewal programme 1952, and from a particular part in the mid—2020s, fire of the ocean, and people risks will continue to be are applying science to that that constantly assessed. wasn't thought of back in those years, and plastic is a typical example, so i kind of like to think all this effort we are putting in here, some bright sparks going to university or maybe even just being born now will apply ina some amazing science in a moment we will be catching up to what is being caught with all the business news but first as we are speaking now. this mission first dove a look at the headlines. beneath the surface around the time hundreds of millions of euros plastic was invented. 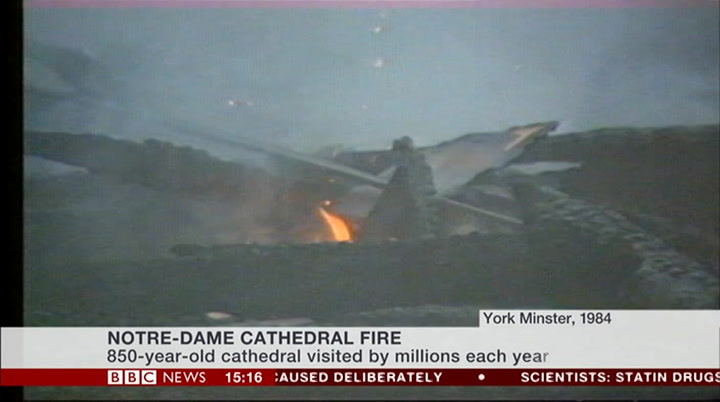 now it will continue to provide are pledged to return vital information to help the notre—dame cathedral in paris reduce the impact of our to its former glory after firefighters work though the night to save it letter on the oceans. from a devastating fire. 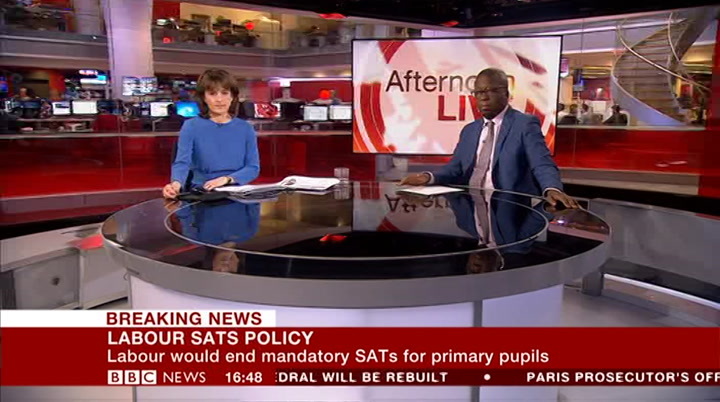 breaking news — that the labour party leader jeremy corbyn has said a labour government would scrap the sats exams or standard assessment tests which are compulsory at the end a night of shock and despair but of a child's primary education in england. relief that the main structure of the government had already announced that from 2023 the building stays intact and seven—year—olds woulds no longer have to take their sats. mr corbyn said labour's policy would relieve pressure on schools and ‘prepare children for life, experts say the main parties intact. 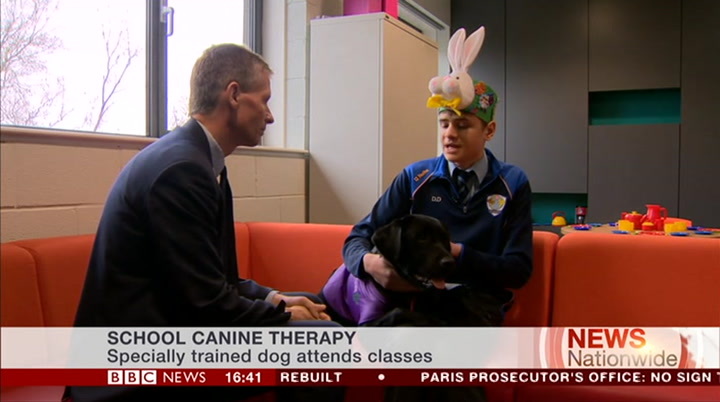 not just for exams'. let's chat about jobs. 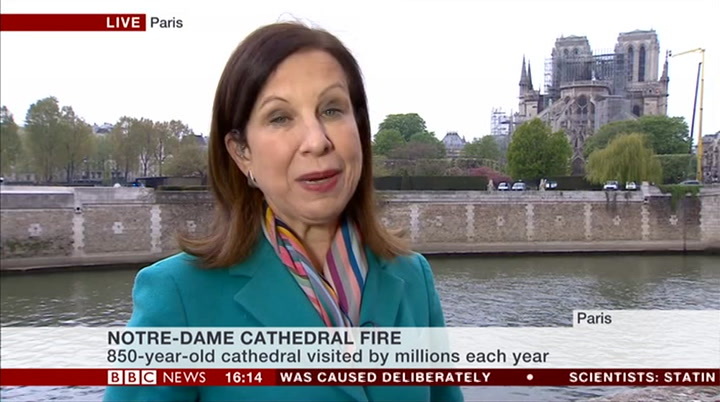 cathedral in paris to its former glory after firefighters let's chat aboutjobs. there are more of them. 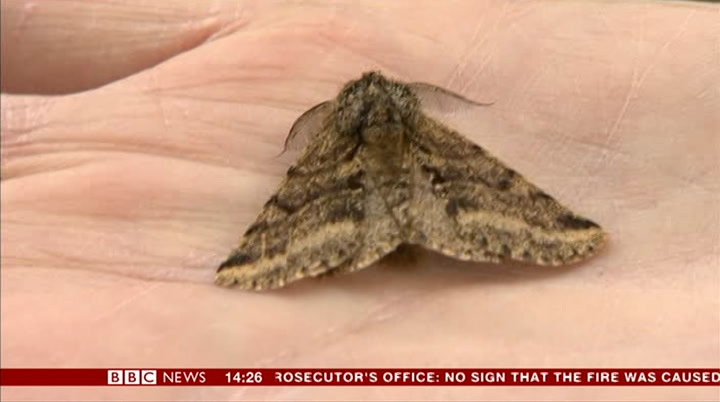 more of them and fewer work though the night to save it from a devastating fire. 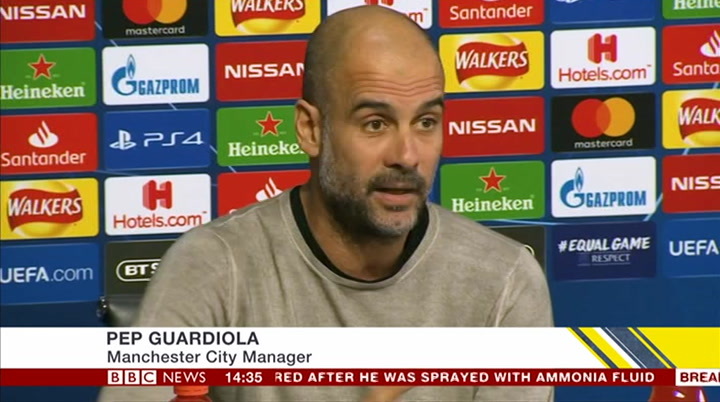 the extent of the damage is revealed, people unemployed. 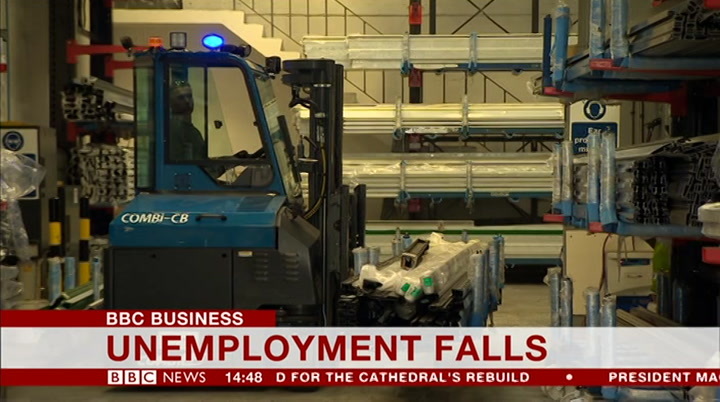 unemployment has as french president emmanuel macron vows to reconstruct fallen to 1.34 million, the lowest the historic building. 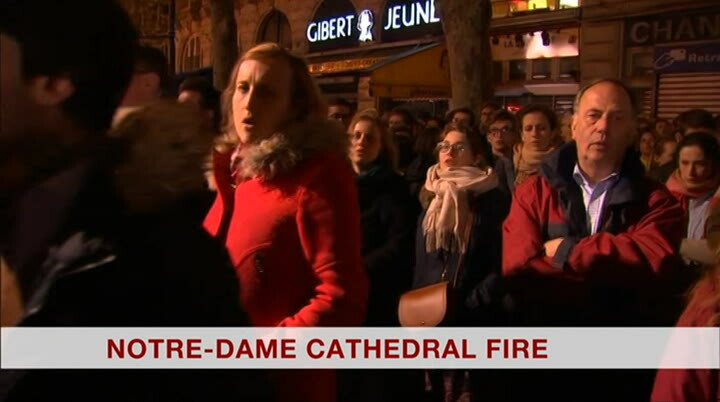 a night of shock and despair it's been since 1975. we have also in the french capital, seen an increase it's been since 1975. we have also seen an increase in the number of but relief now that the main people in employment, that figure structure of the building remains intact. officials say they're treating the blaze as coming in almost 33 million people, an accident — not arson. 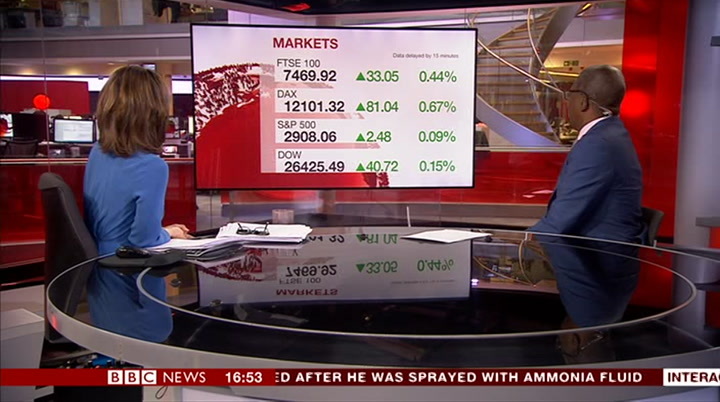 and that is a record high, so pretty here's your business headlines on afternoon live. 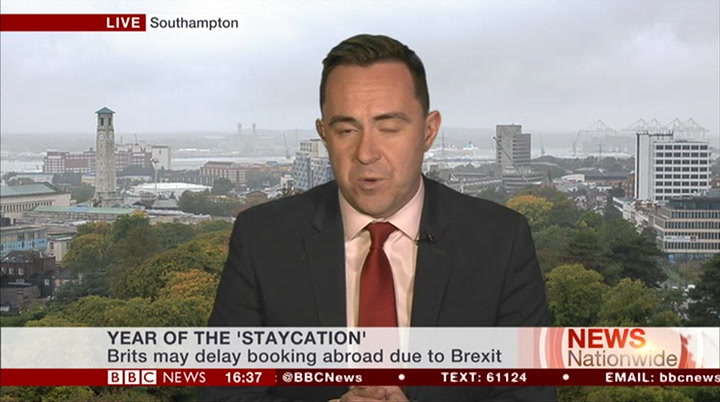 robust situation there. 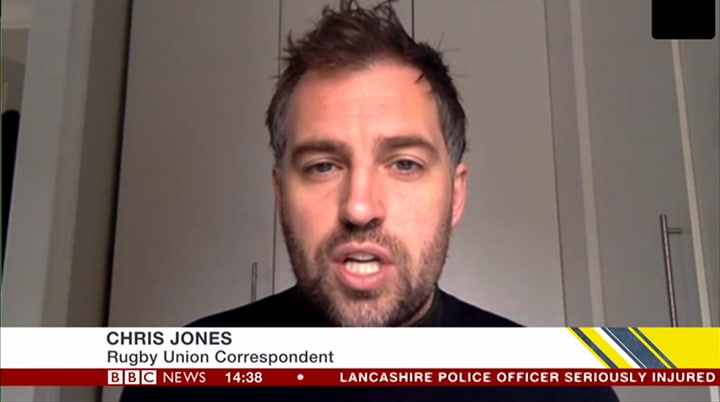 the others people and jobs, are they getting more than 120 climate change activists have been arrested for blocking roads in central london paid more? yes, they are. the during protests which brought parts of the capital to a standstill. 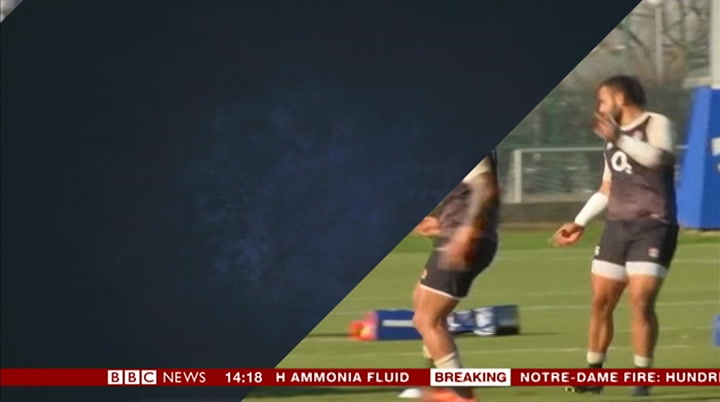 a second day of disruption is under way. figures for the three months to police have february have shown that average ordered protestors to stick to the marble arch area. 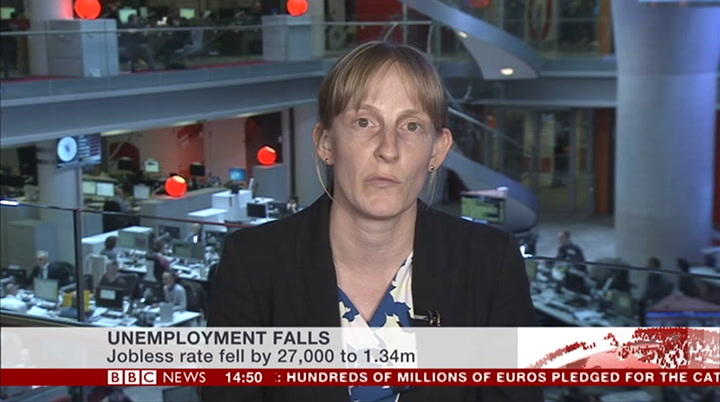 wages including bonuses have gone up by 3.5%, higher than inflation, so they should be some easing of unemployment fell by 27,000 in the three months to february — the figure pressure on household budgets. but coming in at 1.34 million. 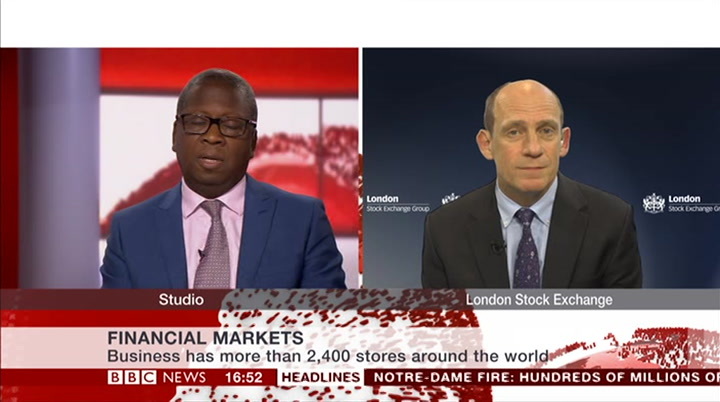 the big question is, we have heard average weekly earnings, including bonuses, rose all about brexit uncertainty, how by around 3.5% — that's can we have such strong and robust in line with expectations. 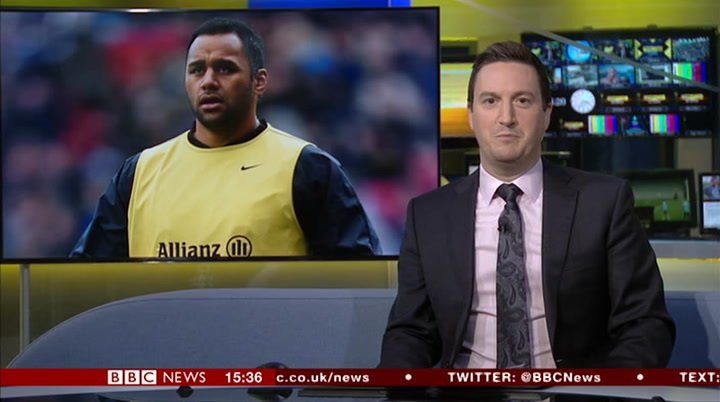 jd sports has defied the gloom situation regarding jobs? one a nalyst says situation regarding jobs? 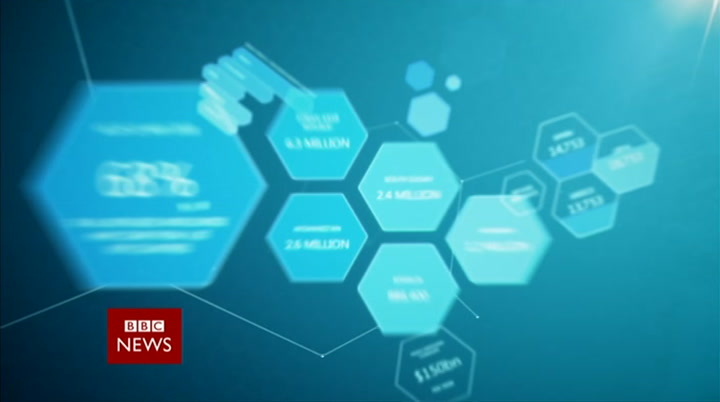 one analyst says that the uncertainty on the high street to post record could actually be helping with job annual profits of almost £340 million. that's up more than 15%. its chairman peter cowgill told situation. 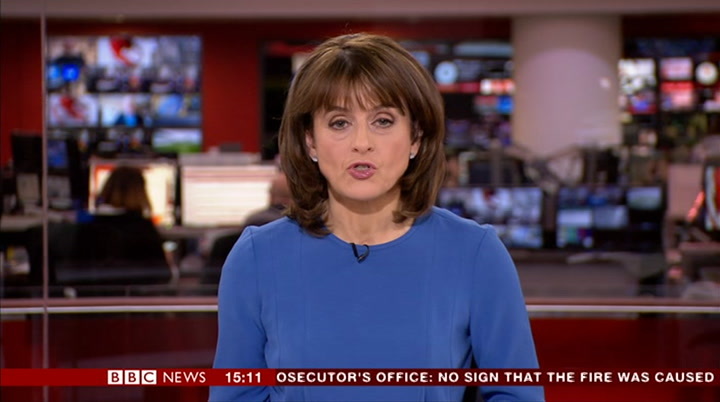 the bbc the figures have been helped the labour market has shown by a focus on younger customers. little sign of flagging. employment posted another bumper rise of 179,000 in the three months to february, and that was driven largely by employees and full—time workers. and the unemployment rate too remained at its lowest there's been some good since1975 at 3.9%. i think the recent strength news on the jobs front. in the labour market seems to reflect firms opting to hire more workers rather than to invest in more costly investment projects, and that's perhaps not too surprising in uncertain times. 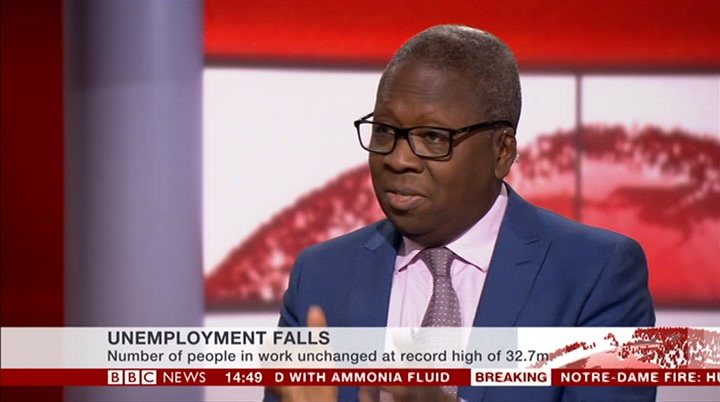 so, the unemployment figure has fallen to 1.34 million. 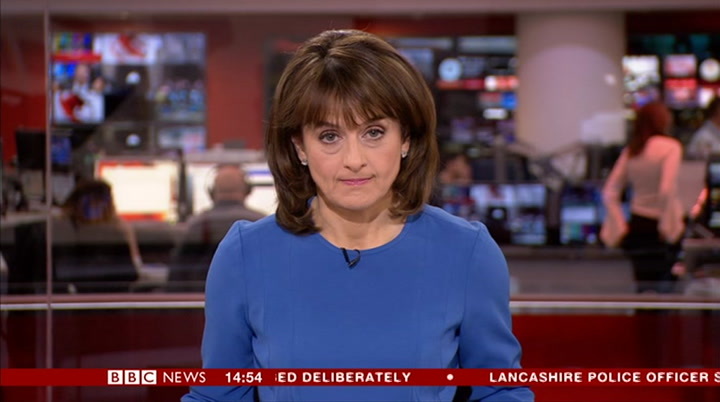 that is the lowest it has been since 1975. and the number of people in work, that it's easier to reverse hiring decisions than is to reverse is atan the number of people in work, that spending in plant and machinery, is at an all—time high of 33 million, and tied in with all of which require larger upfront costs. thatis million, and tied in with all of that is news on wages. wage growth so, despite brexit uncertainty, the recent strength in the labour has outstripped inflation to come market appears to have been because of the prolonged period m, has outstripped inflation to come in, if you include bonuses, at 3.5%, of brexit uncertainty. phrase, sticking to your knitting. prices are getting a real boost. that is a new one on me as well. you this car factory —— card factory has can't tell me what it means, then. no idea. 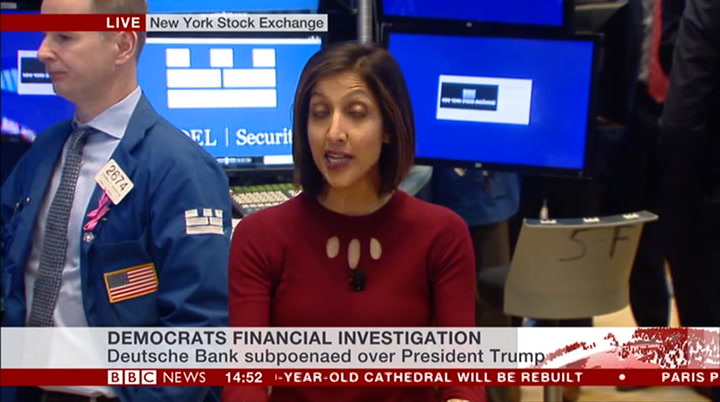 let's look at the markets. seen a drop in profits but investors are excited by the fact they have icy of green. again, yes. the ftse has been boosted by that news of the seen a big rise in the number of people buying stuff online from them, so there is hope that it might healthy jobs market rebalance their business away from has been boosted by that news of the healthyjobs market the german index the high street and concentrate has done well because of improvements in business sentiment perhaps more online. 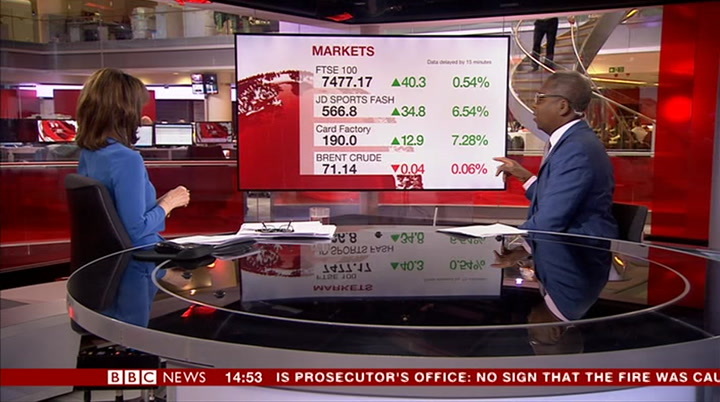 brent crude, and the us markets have been boosted by positive news on company results. there could be some sort of intervention by o great. 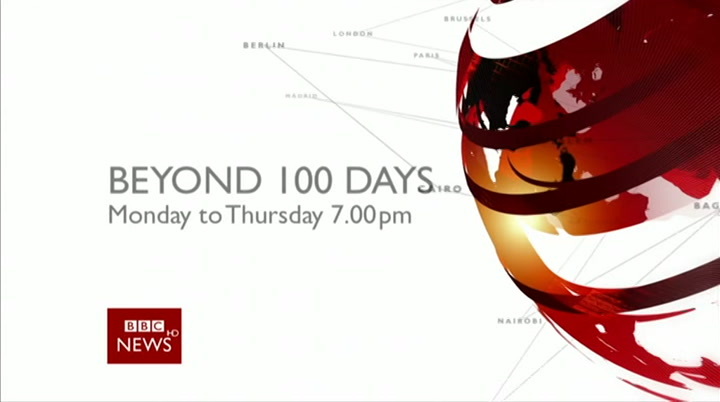 are you back tomorrow? i am there could be some sort of intervention by 0 pack to cut not. well, enjoy whatever you are supplies. that had had a boring doing. thank you so much. good to spend the afternoon with you. effect on the price of crude but as we can see there the price of crude thanks. falling back now. 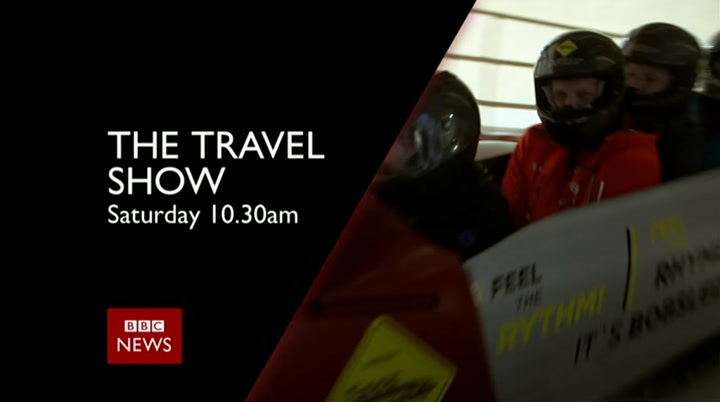 more from you in an hour? indeed. look forward to it. now let's return to images from paris — a city still in shock after the devastating fire at notre—dame cathedral. let's return to paris. 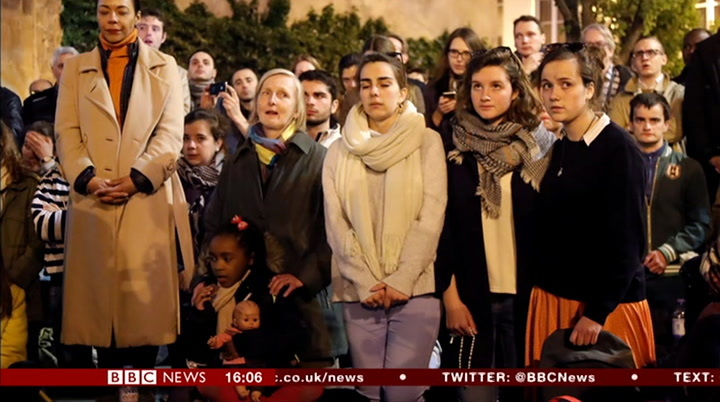 the news today has been better than many feared but, for parisians, it was a very long night. south—east, bringing this warm air temperatures higher still on good friday. this chart bodes very well across the british isles. 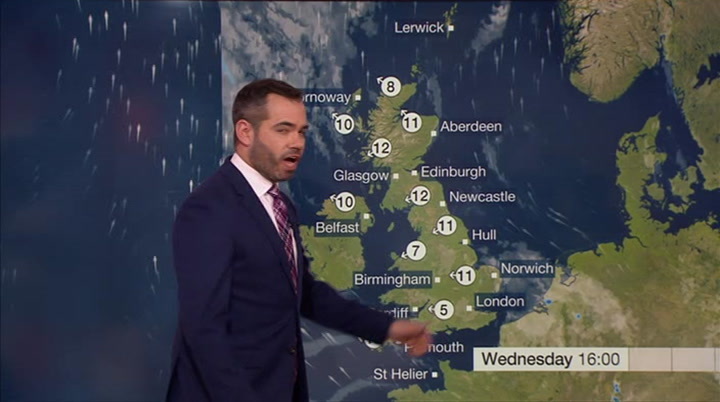 thursday will be a day of patchy cloud and indeed if you are looking for blue sunny spells. you will still notice skies overhead. sea breeze is likely the strength of the wind so still feeling a little cool for some of to develop around the coast, light these coastal areas in the east but went elsewhere, but 22 celsius in elsewhere the temperatures up into the high teens or even the low 20s. 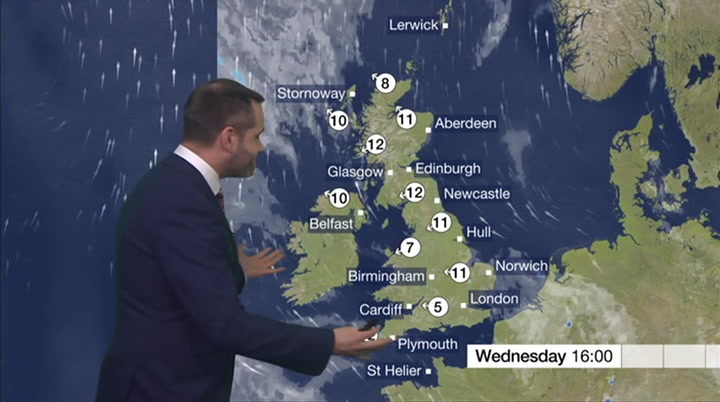 london, in birmingham 21, and the looking ahead to good friday and the warmth continues. we could get to the middle 20s for some, the further start of the eastern weekend, and predominantly blue skies overhead by south and east you are, this stage. 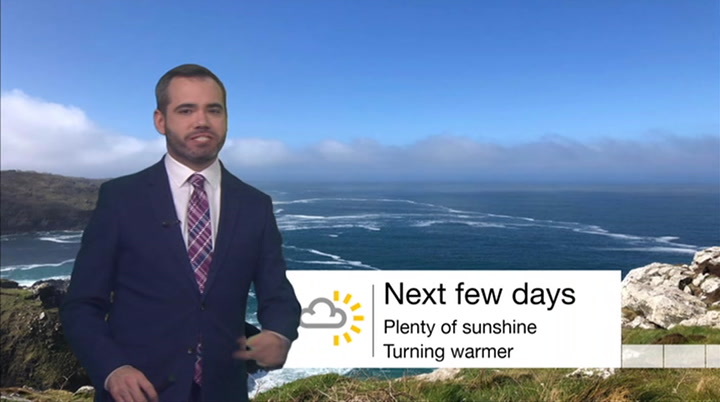 very light winds, sea predominantly dry right through the weekend, but further north and west breezes developing down towards the the chance of rain which will creep south, inland areas up to around its way in. about 22 degrees. we might be able to add another degree or two onto those temperatures as we get on into saturday. the further south you are, it should stay dry. further north and west, bit of rain will creep in. the champions league. more later. thanks, hugh. 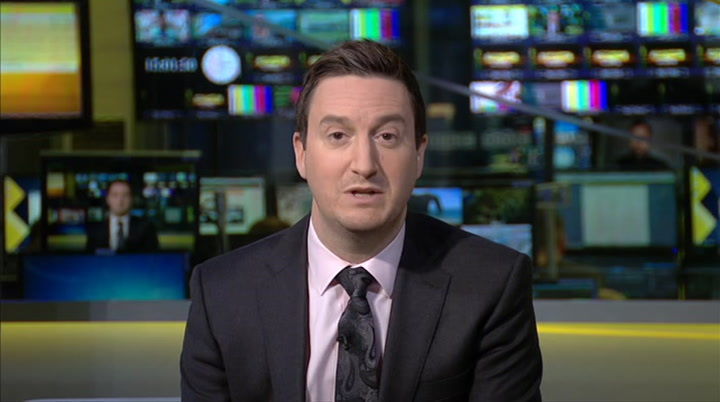 and ben has all the weather. cloudy now, but warming up for the weekend? absolutely. temperatures into the middle 20s, notjust yet, today, a lot of cloud, outbreaks of rain, it isn't sticking around. 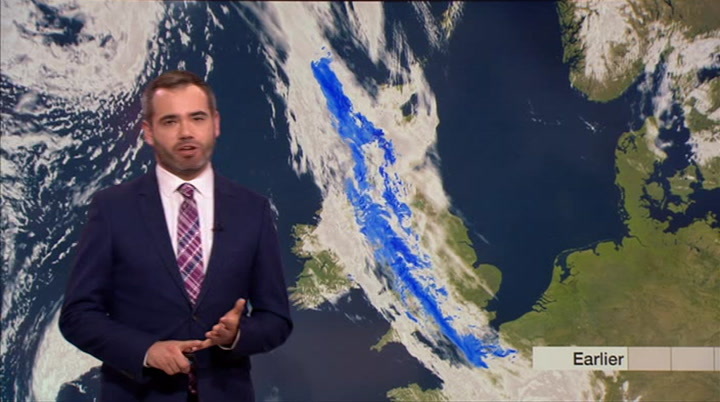 all the details on uk weather plus news ofa the details on uk weather plus news of a wet spell of weather in the republic of ireland on the way. 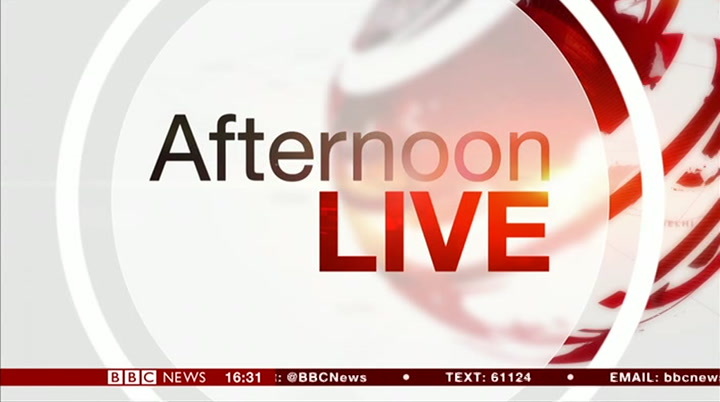 hello, everyone, this is afternoon live. 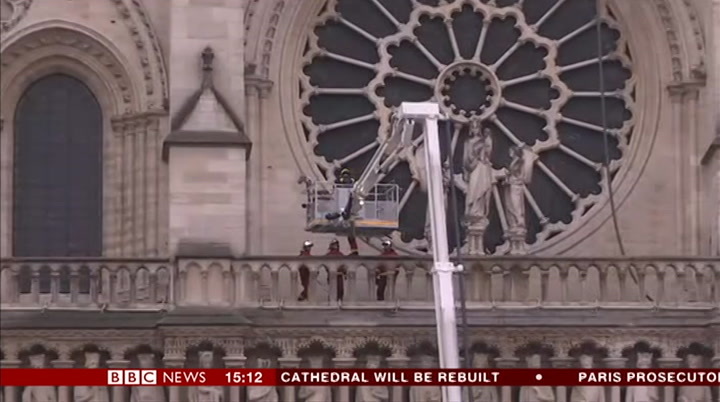 the moods of desperation and sadness in paris last night have been replaced this afternoon by those of hope and resolve as france comes to terms with the devastation caused by the fire at notre dame cathedral. 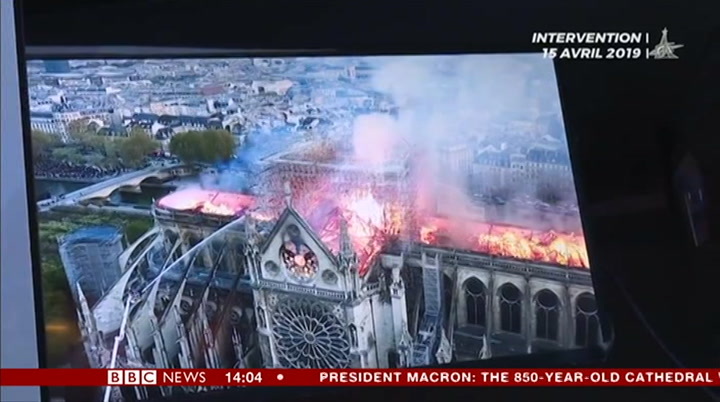 president emmanuel macron has promised it will be rebuilt the roof of the 850—year—old landmarkmark, as well as the spire, were destroyed. officials in paris say they are treating the fire as an accident, rather than arson. damp to be revealed. 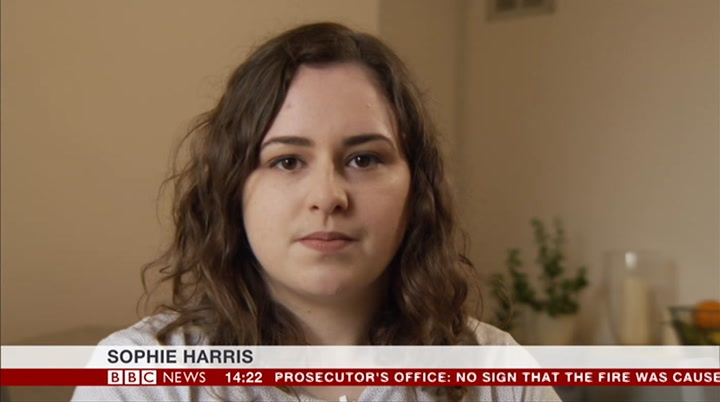 the public prosecutor has assigned a team of 50 people to be believes will be a long and complex and that. roofless, smoke scarred but still standing. there were times overnight when many feared this ancient cathedral would not survive the inferno. but those assessing the damage today are now confident the worst is over. translation: the whole fire is out. was eventually lost. singing. overnight, parisians kept a vigil, the streets around notre dame filled with the sounds of mourning. 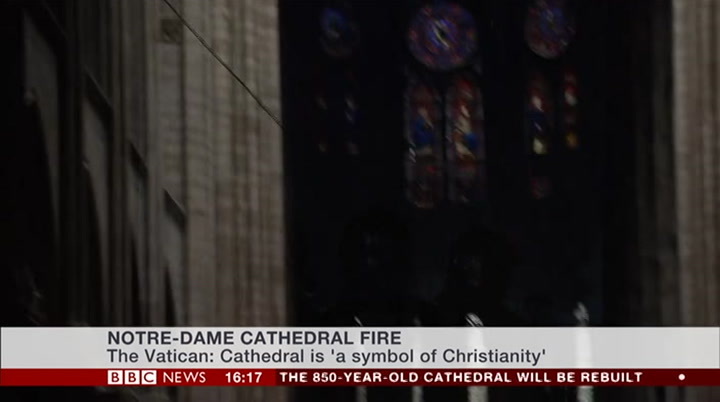 translation: there are hundreds of people who died to build the cathedrals and in here is their memory too. it hurts to see that. it's sad that a monument like this burns. it's very sad. it's one of the great monuments of france. i studied history and it was very important for me to come and see her. maybe for one last time before she was no longer there. 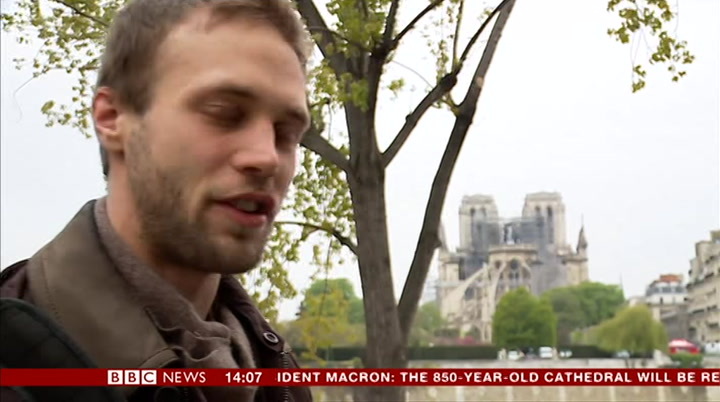 notre dame has been at the heart of french national life for almost six centuries. it's where joan of arc was declared a saint and napoleon became an emperor. today, though, it's scorched and rubble strewn, most of its treasures were taken to safety, there are years of restoration ahead. bells ring. 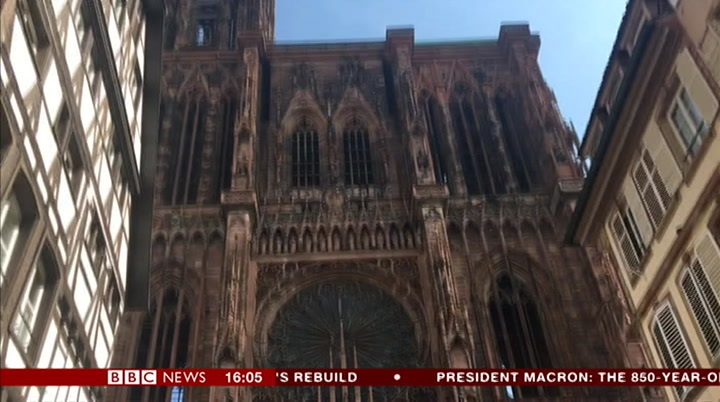 at noon, bells rang across europe in solidarity with paris. 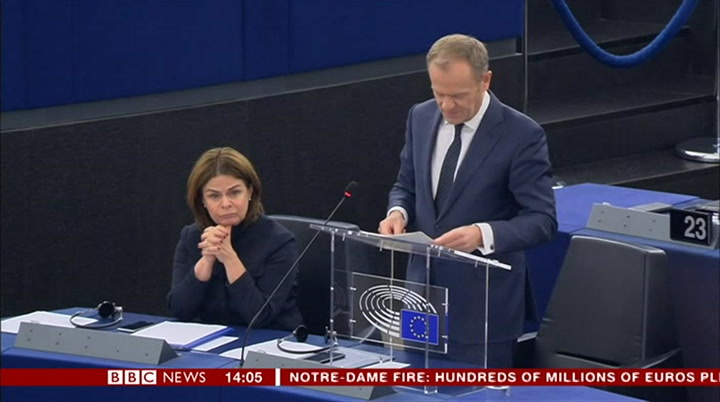 in strasbourg, home of the european parliament, there were also pledges of support. but at stake here is something more than just material help. 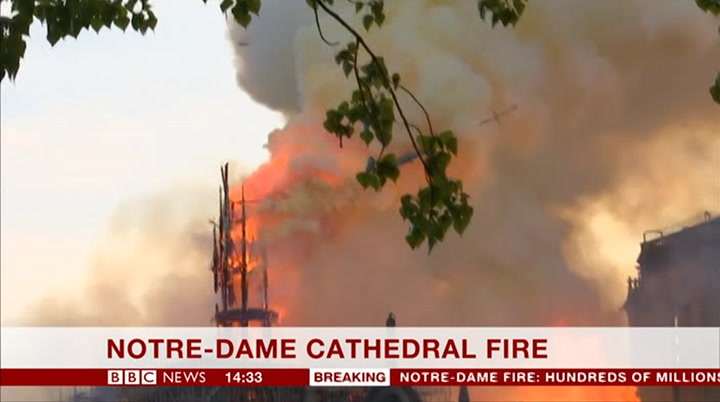 the burning of the notre dame cathedral has again made us aware that we are bound by something more important and more profound than treaties. the french billionaire francois—henri pinault has pledged 100 million euros for the restoration effort, oil firm total has done the same. planning the reconstruction began this morning. the prime minister edouard philippe and his cabinet know that france be watching. surveys of the building are already under way. 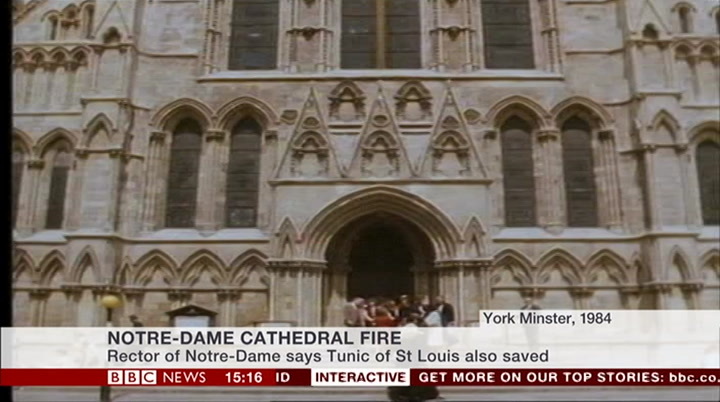 it was initially suggested the fire may have been caused by building work at the cathedral. questions remain about that, though and about why a better plan for dealing with a fire on this scale was not in place. 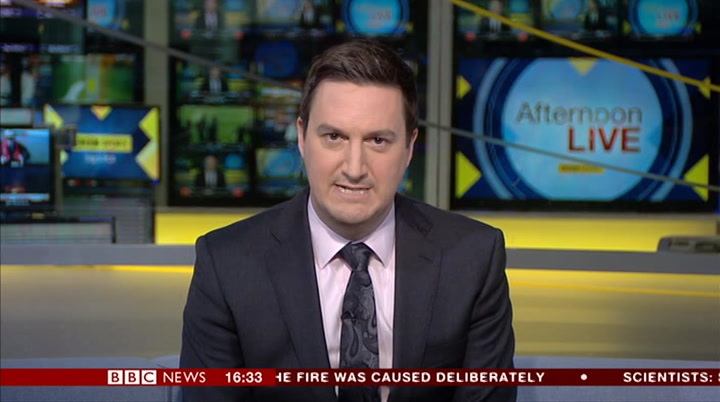 richard lister, bbc news. 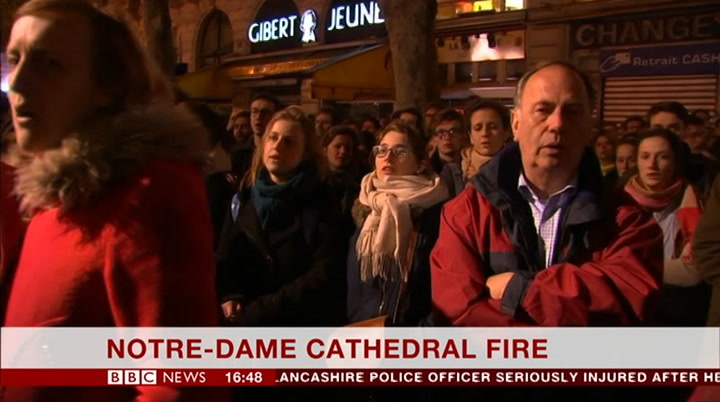 thousands of people gathered in the streets around the cathedral, some weeping, others singing hymns or saying prayers. 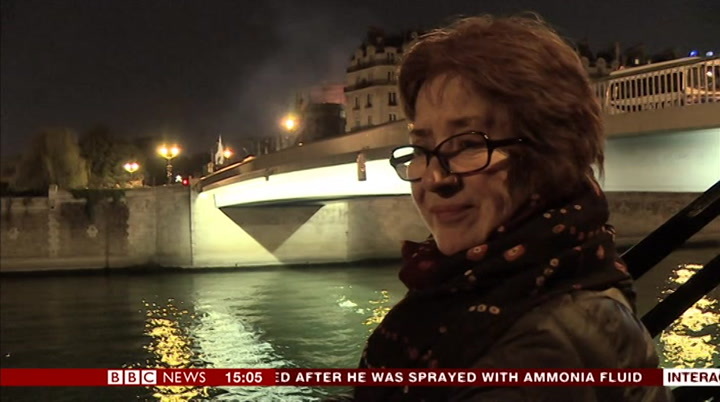 our paris correspondent hugh schofield reports now on how the people of paris have reacted to the fire. this morning the parisien scheme to see for themselves, the inferno was felt as a trauma, and the needed reassurance that the worst had not come to pass. the firemen are heroes. we applaud them. they stayed until the end. 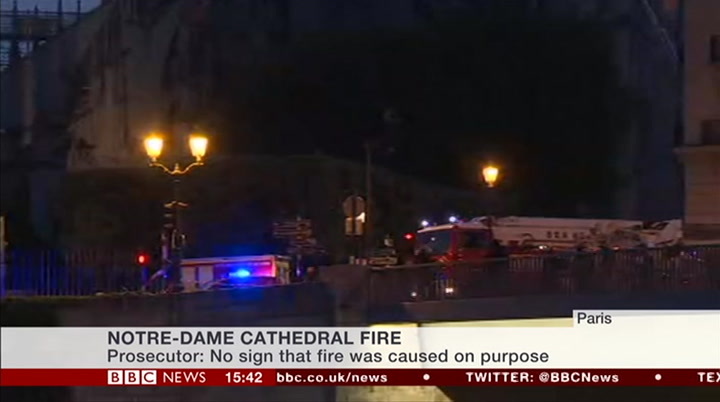 the cathedral was home to some historical treasures, and emergency teams had to rescue many works of art and religious items. police and others formed a human chain to rescue artefacts. 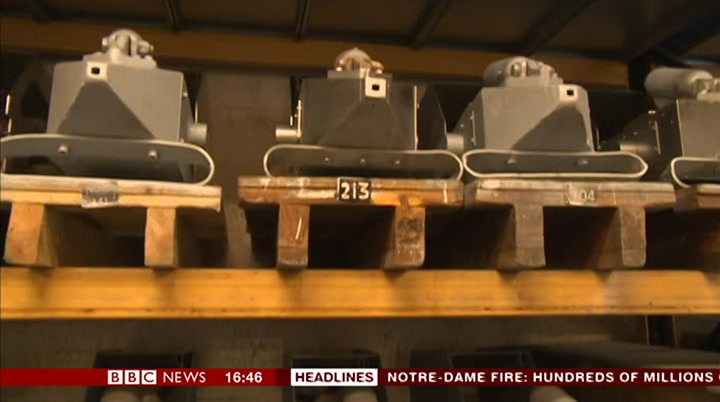 paul adams reports on notre dame's artefacts. as the smoke clears, and the shock passes, what has been lost, and what saved? 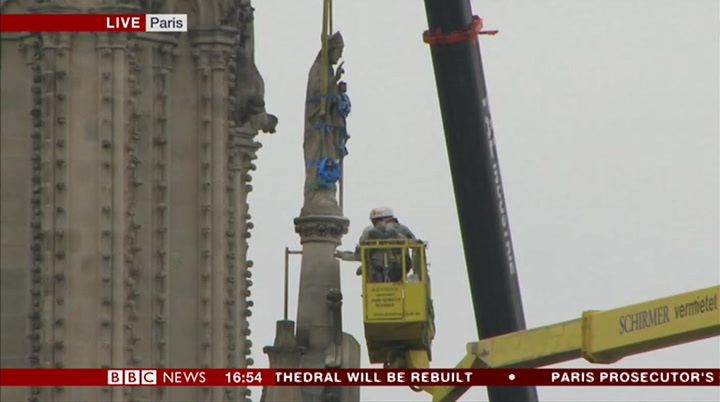 despite the apocalyptic fears the bulk of notre dame's a 800—year—old stone structure seems intact. glimpses of the interior also give cause for hope. above the smouldering wreckage of the walls show little signs of damage. 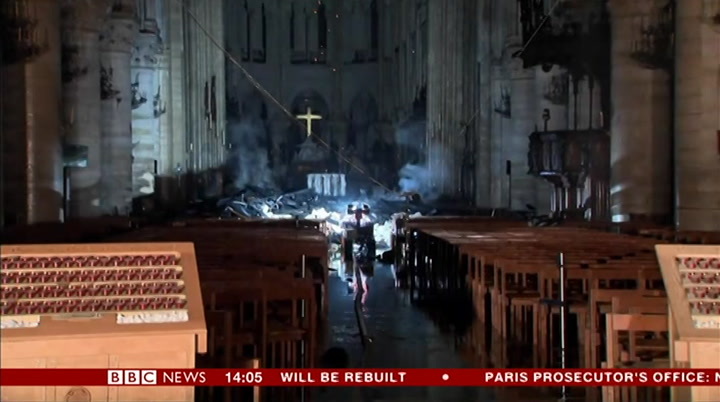 the pulpit, here on the right, unscathed. 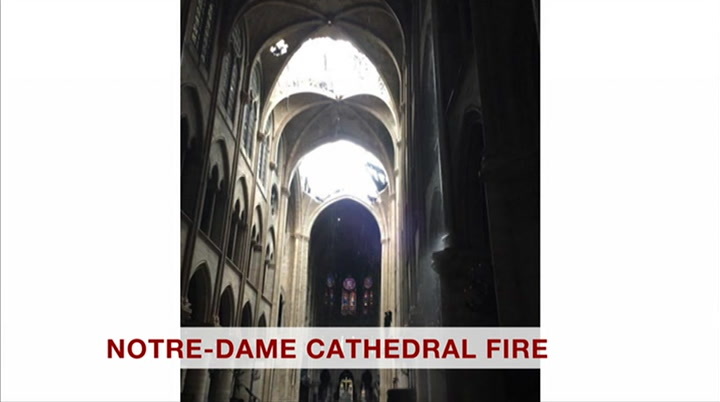 miraculously, most of the vaulting above the nave has not come down. last night there was talk of lead melting and glass exploding. 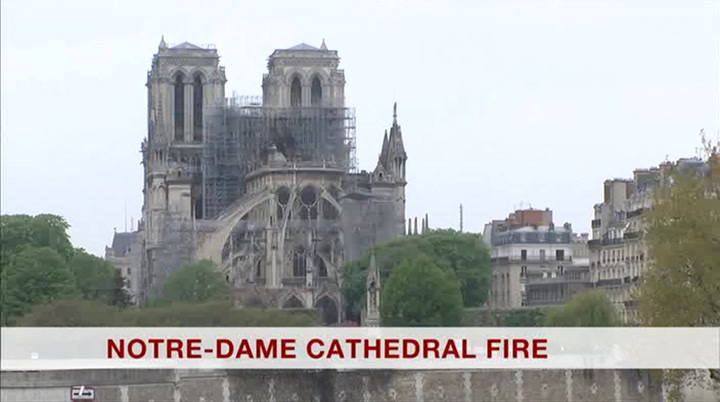 the west window shows no signs of damage, but these are immense and intricate structures, it will take time to assess them. the south window was given by louis ix around 1260, it contains scenes from the life of christ, wonderful 13th century artistry. these were among the finest rose windows, the finest painted glass, to survive from high medieval europe. 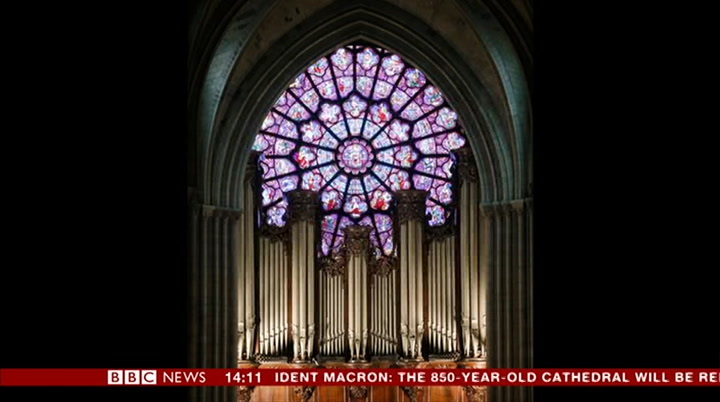 questions too about the vast 8000 pipe grand organ, recently restored, dating back to the medieval period. 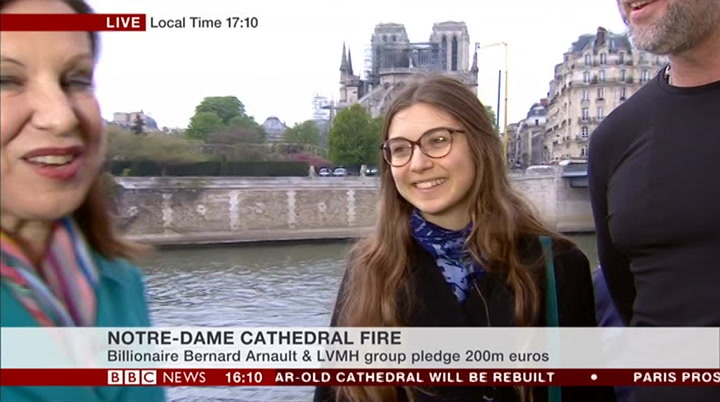 notre dame has been at the centre of french life for the better part of 1000 years, now it must close its doors, count the cost, and begin the long process of restoration. 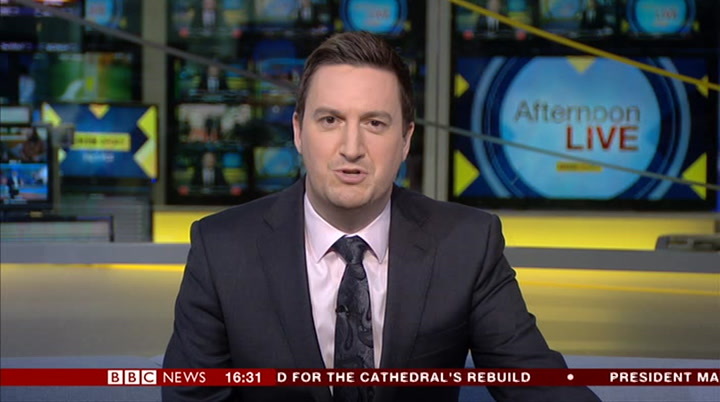 paul adams, bbc news. 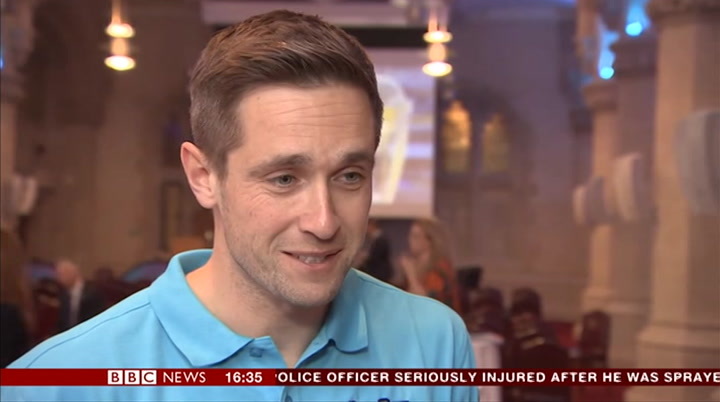 clinched the treble with a late goal for united in 1999. and the inclusion ofjofra archer in the preliminary world cup squad would be morally wrong according to one of the other bowlers hoping for selection. 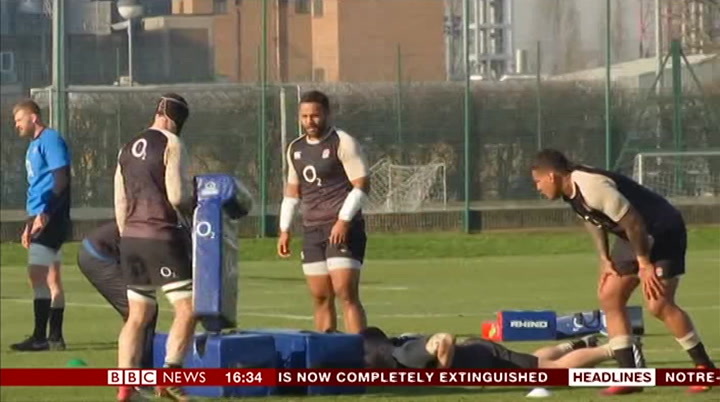 a formal warning for billy vunipola from the rfu after liking a controversial social media post about gay people. 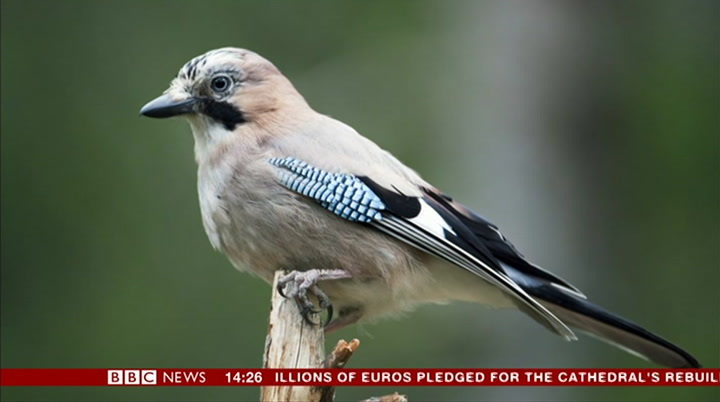 more on those stories just after half past three. when you're watching the tv, you'll often hear or see warnings about flashing images. it can help prevent those with epilepsy from having a seizure. but there's no requirement to do the same online. 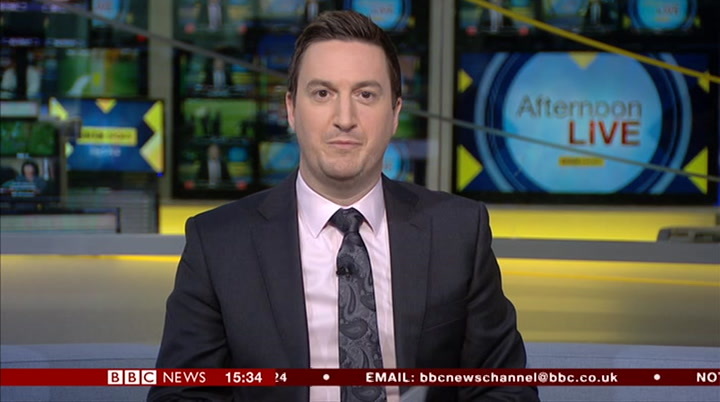 graham satchell reports. sophie's seizures are triggered by flashing light. she has photosensitive epilepsy. 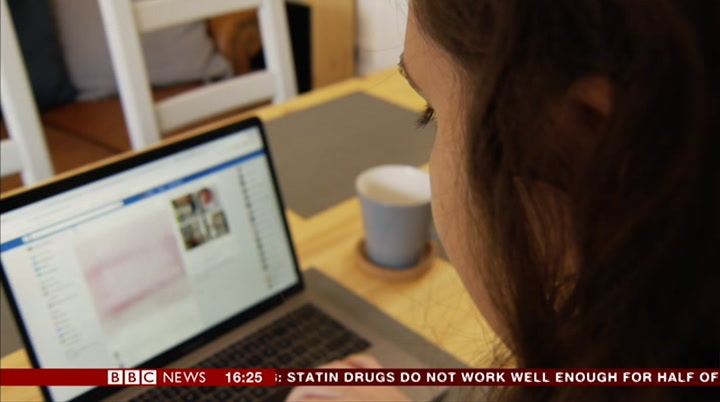 when i'm scrolling through facebook and instagram, i don't know what's coming next. calling upon the government to take strong action by making it absolutely explicit that this sort of behaviour will certainly be illegal in the future. 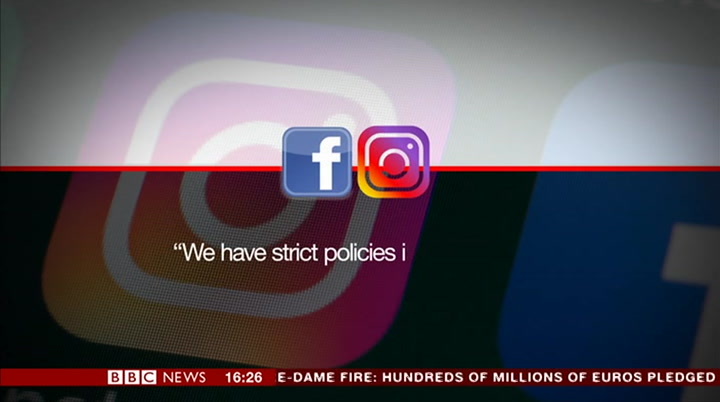 in a statement, facebook, which also owns instagram, told us... but, for sophie, that's not enough. i don't think they're taking enough responsibility. there is a syndrome called sudep, which is sudden unexpected death in epilepsy, which, you can have a seizure and you can die from it, so it's really important that people do control their seizures. 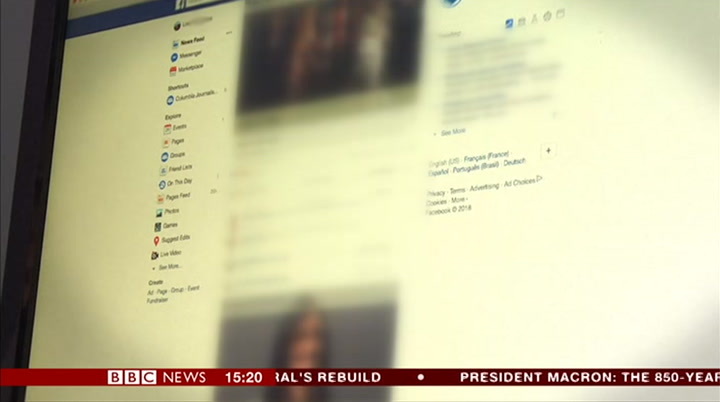 the government is proposing new legislation to regulate social media sites and told us they will consult with the epilepsy society. 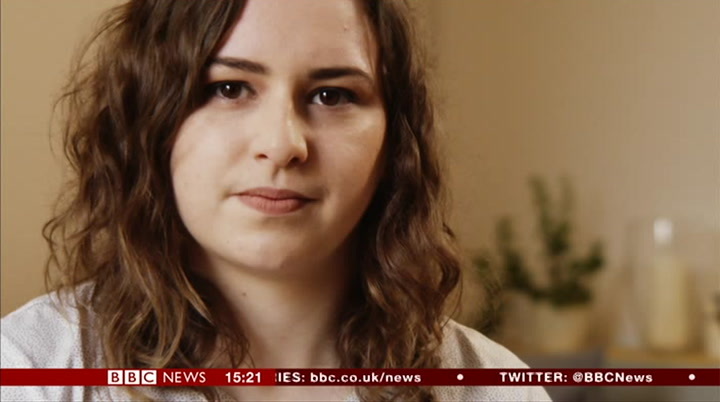 sophie, for one, is clear — more needs to be done to stop people having seizures. 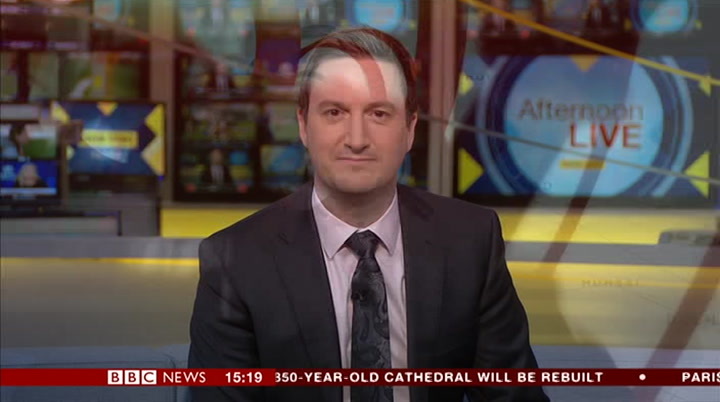 graham satchell, bbc news. 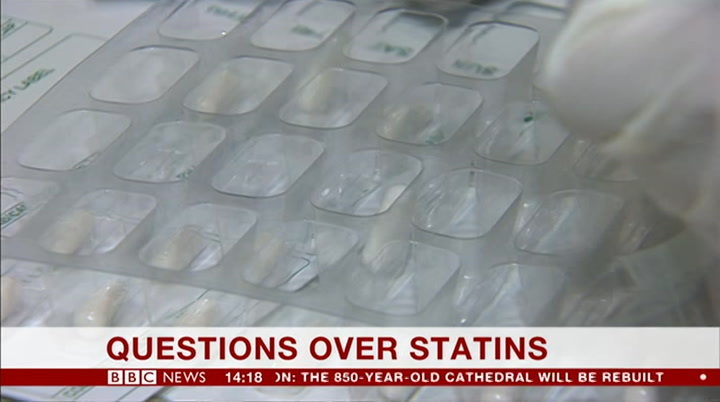 on taking the statins. even if are getting less of a response than we'd like, they are still benefiting from them and they will prevent heart attacks. 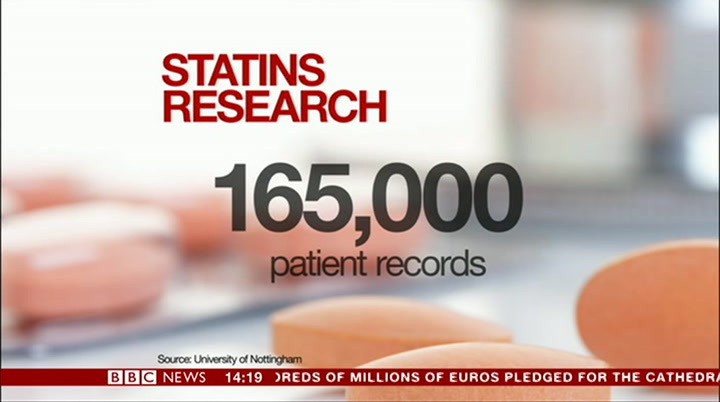 experts stress statins save lives, but say if you have any concerns about your medication, you should talk about it with your gp. 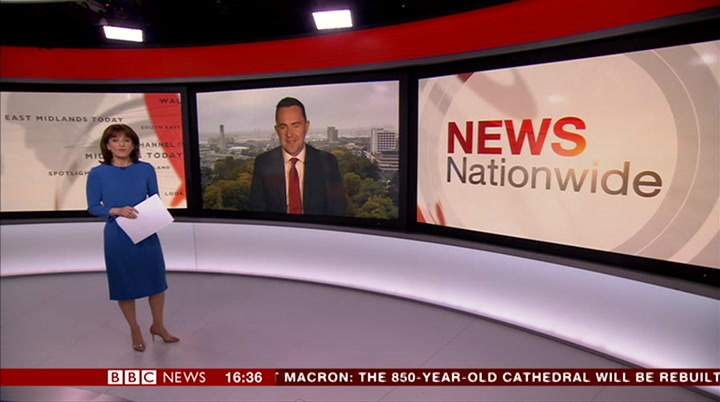 rob sissons, bbc news, nottingham. 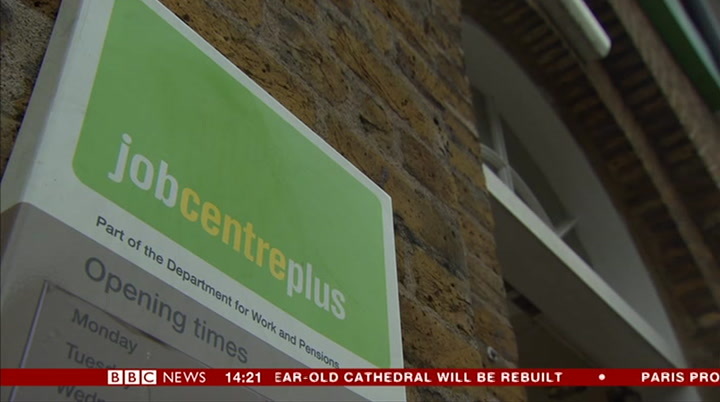 official employment figures show 32.7 million people in the uk are in work, the highest total since records began in 1971. the number of people without a job has fallen by 27,000 in the three months to february, to 1.3 million. average pay rose by 1.5 %, the highest rate since the summer of 2016. police in london have arrested more than 120 people taking part in the second day of climate change protests. supporters of the group, extinction rebellion, remain at a number of central london locations, including parliament square and oxford circus, having camped out overnight. well. that key breeze at this stage brings temperatures climbing, even further to 19 or 20 degrees. 15 in belfast, 17 in glasgow. this is good friday, and it bodes very well, blue skies and sunshine. may be barely a cloud in the sky. less of a breeze allowing some sea breezes to develop close to the coastal areas. that will feel quite like summer, 21 degrees in glasgow, 22 degrees in south wales. it may well be that on saturday some places get into the mid 20s. the further south and east the better your chances of holding on to dry weather. north and west the chance of the rain making its way in. that's all, goodbye for now. 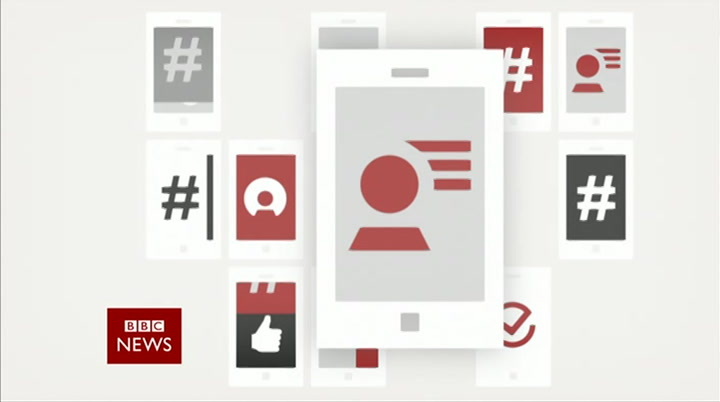 this is bbc news — our latest headlines. 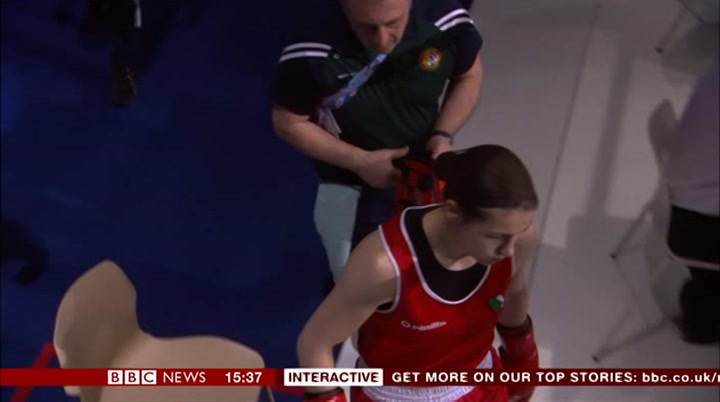 has said just in the last few moments. 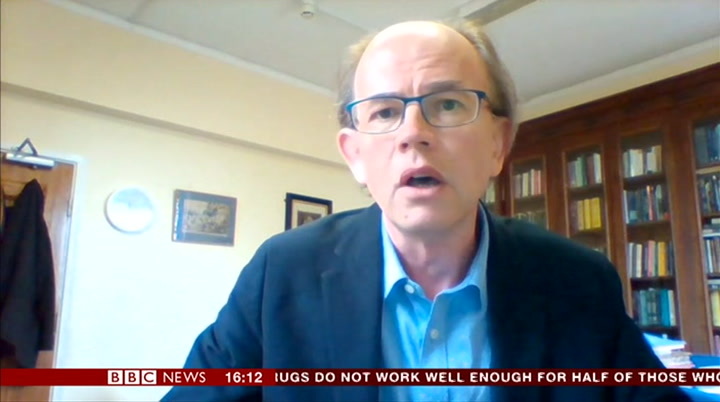 now, egon is here — in a moment he will be telling us what's hot and what's not in the business news. 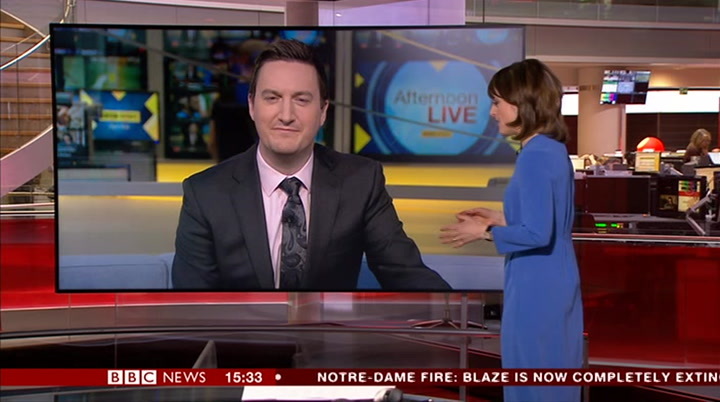 first a look at the headlines on afternoon live. 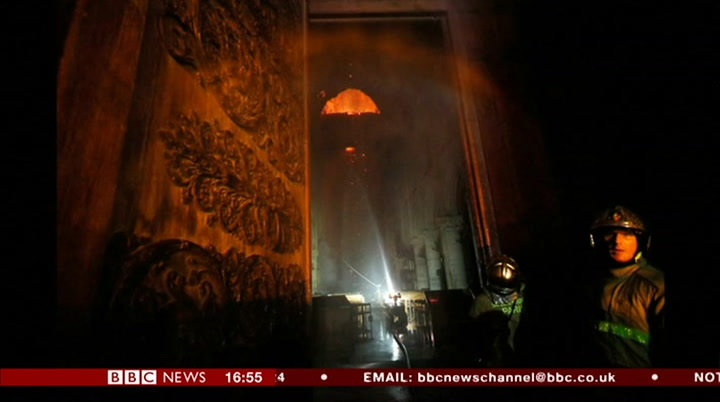 hundreds of millions of euros are pledged to return the notre dame cathedral in paris to its former glory after firefighters work though the night, to save it from a devastating fire. 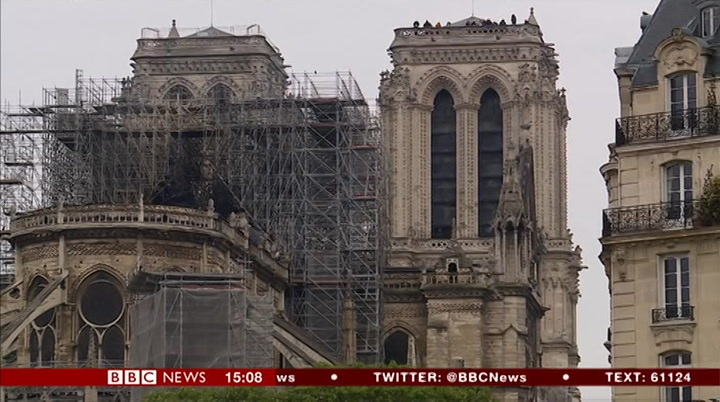 the extent of the damge is slowly revealed as the french president emmanuel macron vows to reconstruct the historic building. 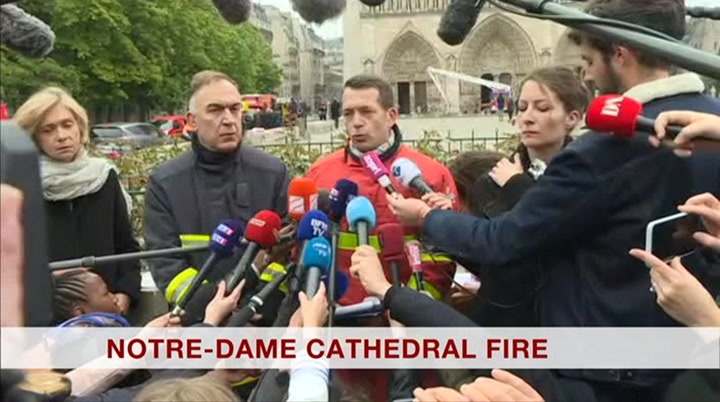 a night of shock and despair in the french capital, but relief now that the main structure of the building remains intact. officials say they're treating the blaze as an accident — not arson. 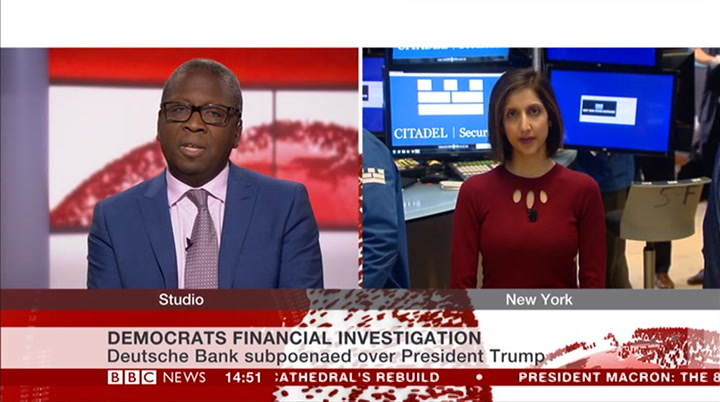 here's your business headlines on afternoon live. 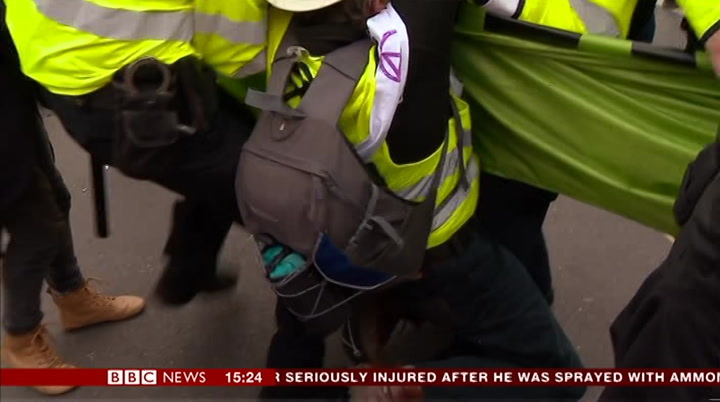 more than 100 climate change activists have been arrested for blocking roads in central london during protests which brought parts of the capital to a standstill. a second day of disruption is expected. police have ordered protestors to stick to the marble arch area. 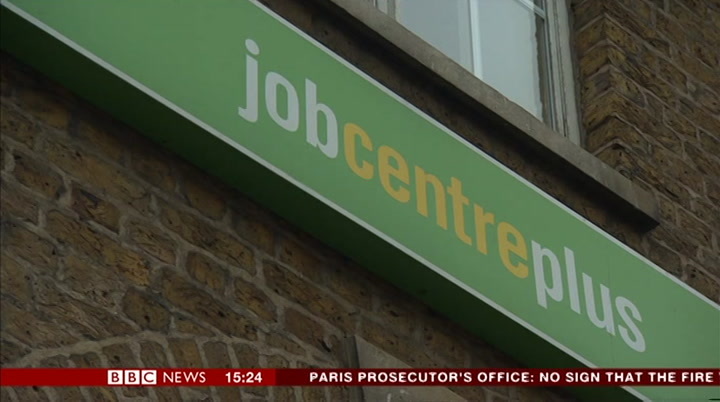 unemployment fell by 27,000 in the three months to february — the figure coming in at1.34 million. average weekly earnings, including bonuses, rose by around 3.5% — that's in line with expectations. 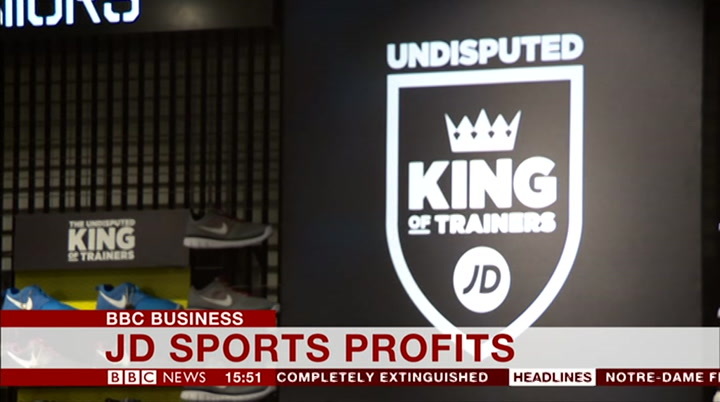 jd sports has defied the gloom on the high street to post record annual profits of almost £340 million. that's up more than 15%. 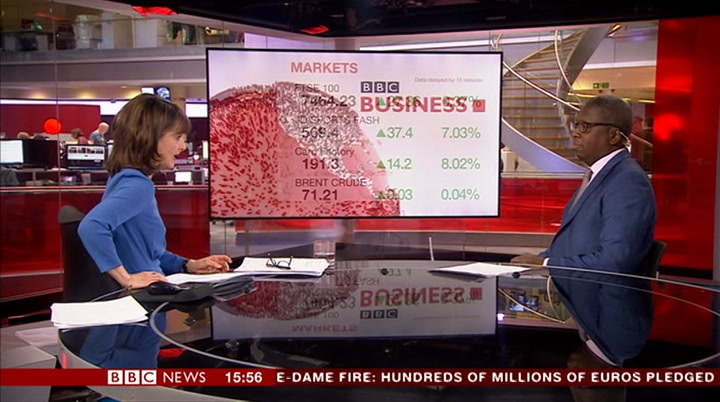 its chairman peter cowgill told the bbc the figures have been helped by a focus on younger customers. the latest snapshot of the housing market is out today. 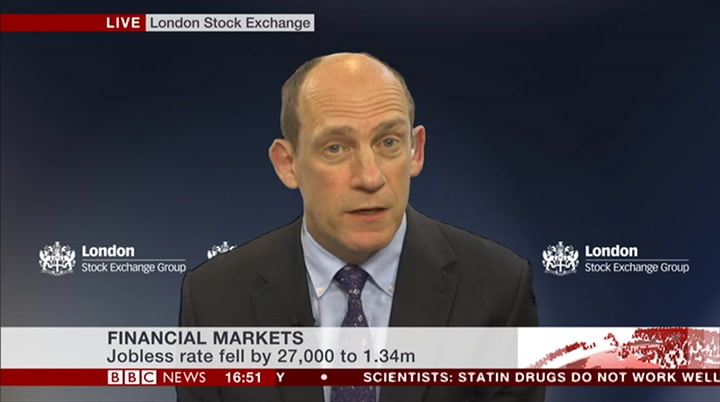 misreporting that mark carney had said — prices are going to drop by 30%. 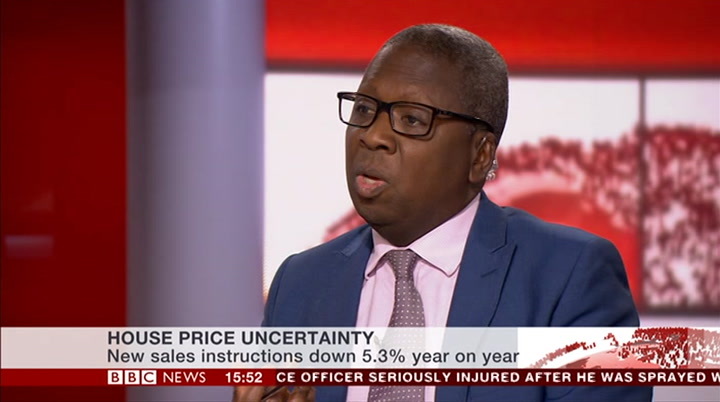 my understanding that what he had actually said was that if prices do file by 35%, the banks could cope. that was kind of a good news story but that made everyone think that if they had to move, they were going to wait to see what happens. people were very worried. 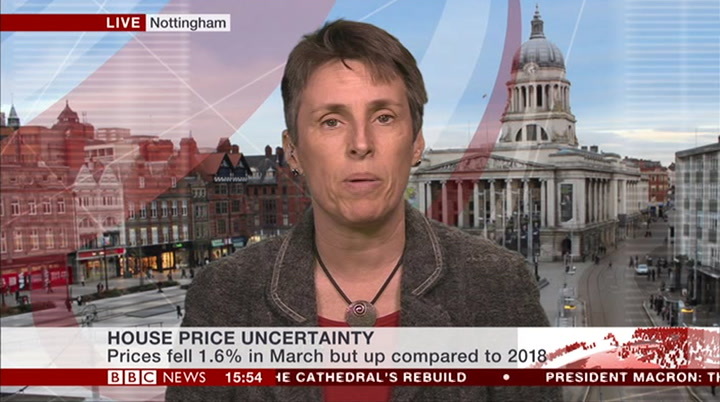 people are right that if brexit happens that prices wilful. 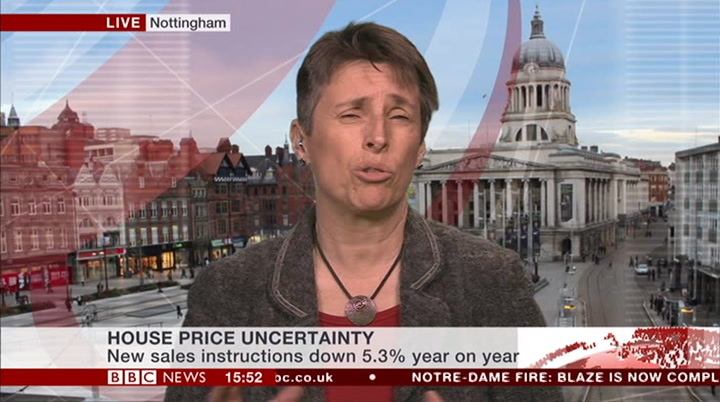 what is interesting is that when you have that uncertainty and those price pills do not really seem to materialise, people start going, well, i am having a baby, getting divorced, getting married, i have found a property and there is a shortage, i may as well get on the ladder. nothing seems to be happening. i think that seems to be happening at the moment because reports for areas such as london and the south—east i that actually they're starting to pick up again, albeit at slightly lower prices. thank you very much indeed. you're welcome. good afternoon. there's a lot of cloud out there today but that is not sticking around through the rest of this week. we will see increasing amounts of sunshine and it is going to turn considerably warmer as well as we had towards the issue weekend. 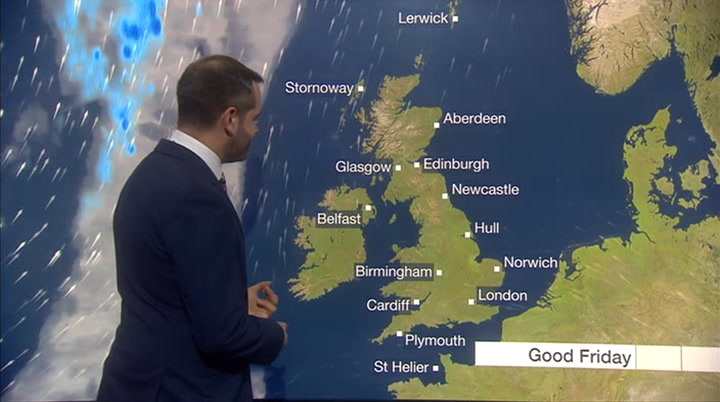 as we head to this evening and tonight, an area of cloud and patchy rain will sit around some parts of the uk. the rain tending to fizzle away, though still damp across western scotland by the end of the night. 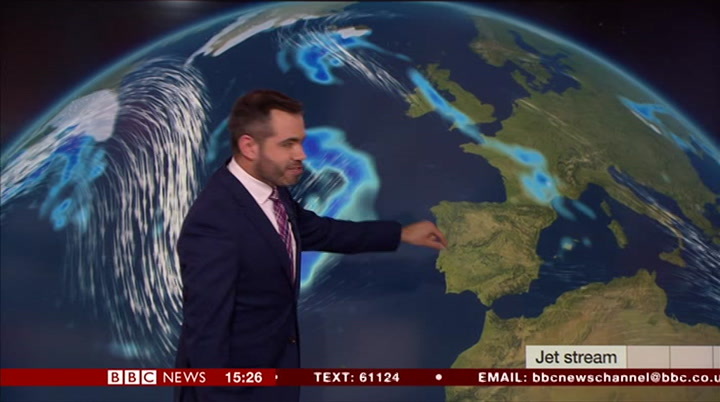 elsewhere, some clear spells and semester in fog in southern england and south wales. most places will avoid a frost. tomorrow, little bit cloudy and mucky in places but that cloud come in fog will break up and then we will see lots of sunshine. the very small chance of a shower and east anglia. a keen easterly breeze or it will feel cool for the north seacoast but inland we will see highs of possibly 20 celsius. 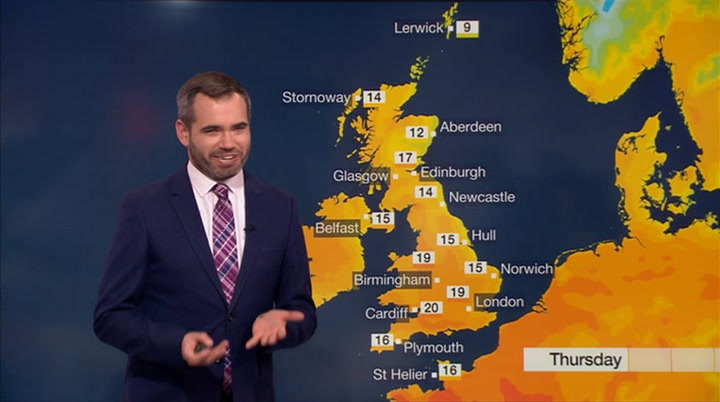 those temperatures continuing to climb as he had towards the weekend. middle 20s possible in the south by the time we 01:58:44,301 --> 4294966103:13:29,430 get to saturday.